Five acres of rolling fields surround the venue with some excellent walking in the Peak District right from the doorstep. 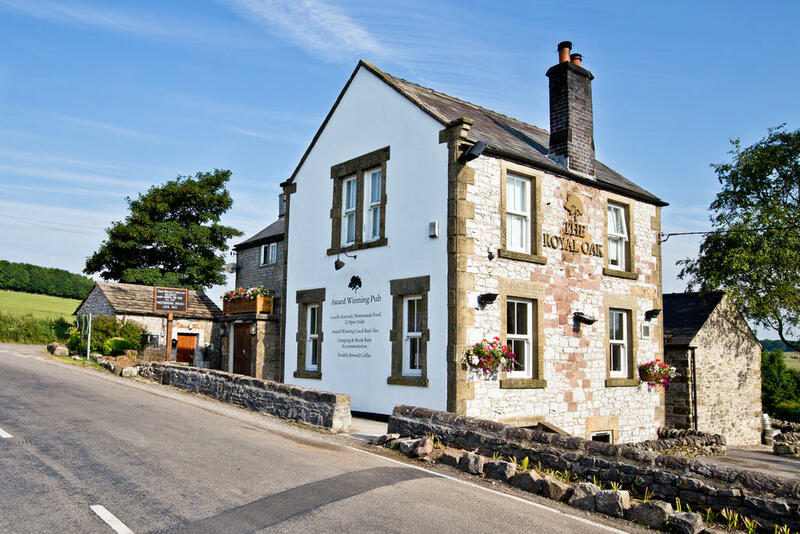 To complete your perfect Peak District holiday, less than a mile's stroll down a country lane or via the nearby Tissington and High Peak Trail, you will find our award winning Royal Oak Pub. We take great pride in offering a very traditional style of hospitality complete with cosy pub atmosphere, great service, cask-conditioned ales, a fine selection of wines, and a menu of hearty home made English pub food. 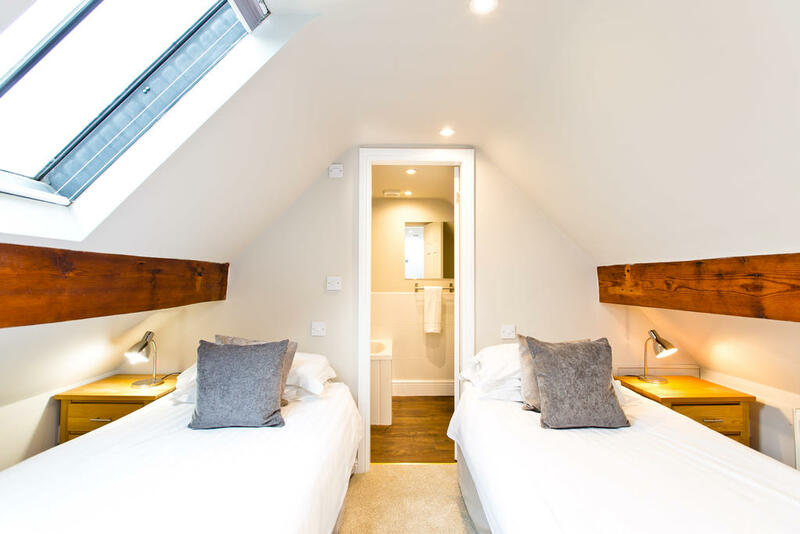 There are a total of 21 bedrooms with 18 bathrooms many being en suite. 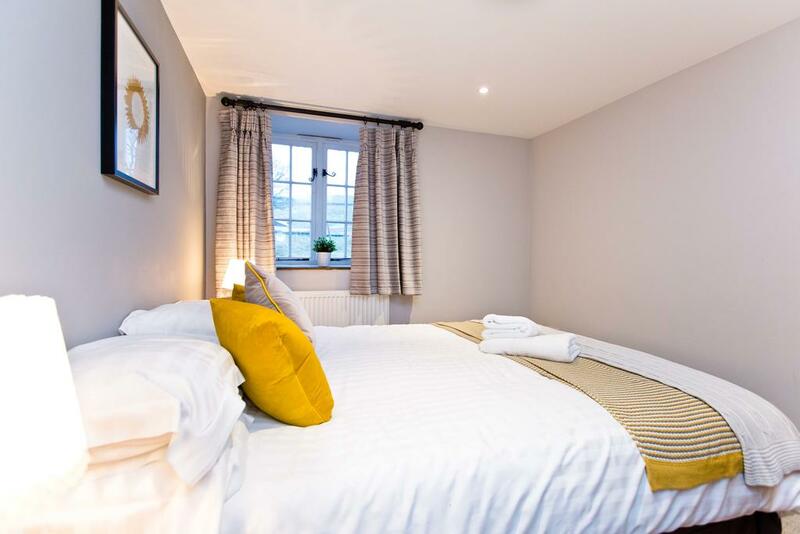 The bedrooms are decorated with a fresh and light contemporary feel and furnished with high quality comfy beds and linen to ensure a really good nights sleep. 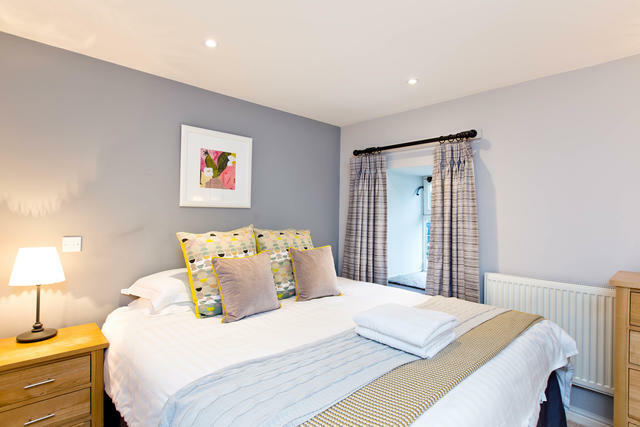 Each bedroom has been finished with gorgeous curtain fabrics and handmade furnishings. 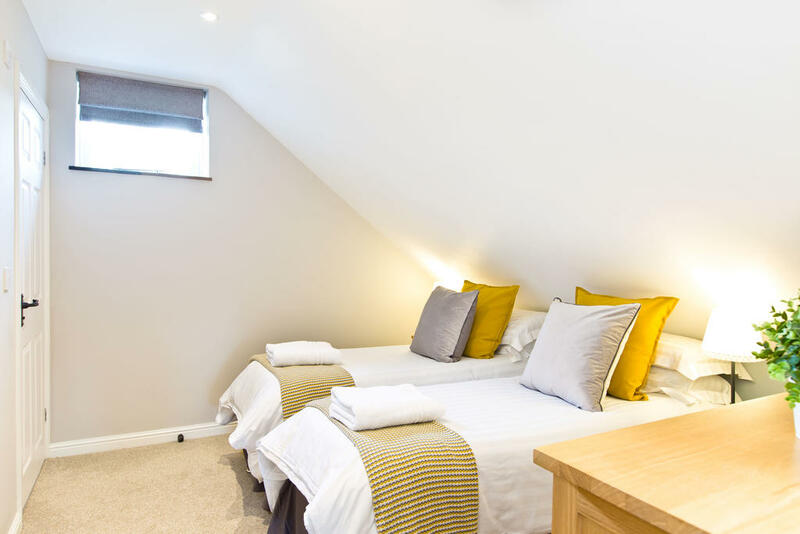 We know all groups come in different shapes and sizes and we are flexible with the set up of the bedrooms to accommodate. With this in mind, most rooms can be made into double or twins. 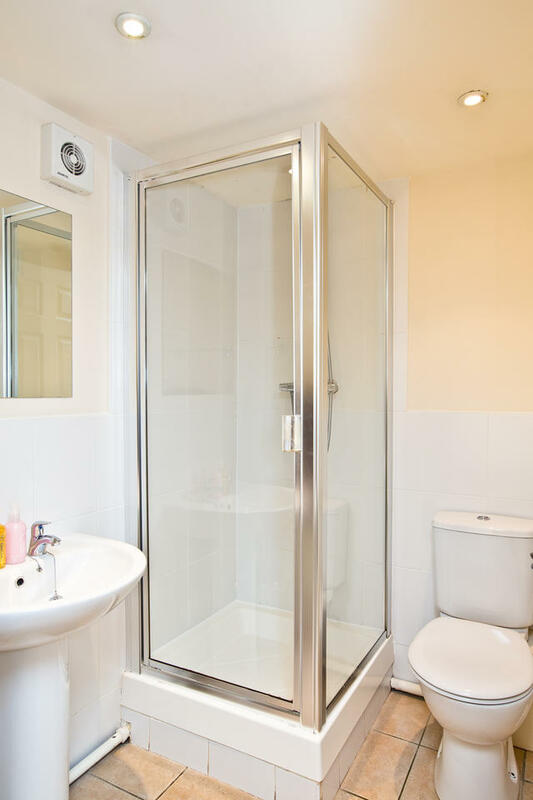 The gleaming white bathrooms are immaculately clean and run off combination boilers to ensure a constant supply of piping hot water. Soft bath and hand towels are also provided for your stay. 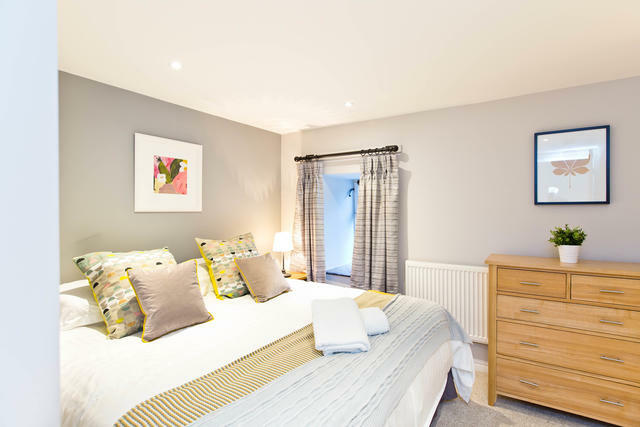 Please click here for the bedroom layouts. Each property has a superb fitted kitchen in a cream finish with all the mod cons you could wish for. 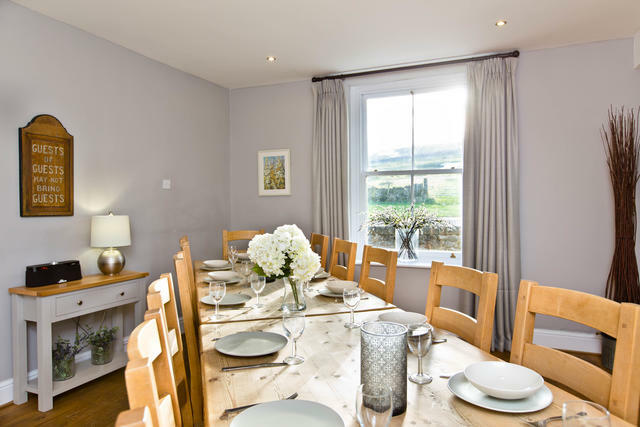 They are individually fully equipped with crockery, pots, pans, cutlery and glassware, perfect for prep-ping delicious holiday meals, you just need to remember the food! We provide fridge/freezers, dishwashers, electric ovens and hobs, microwaves and washing machines. Each dwelling has their own dining space with some properties able to seat larger numbers making communal dining together a real pleasure. 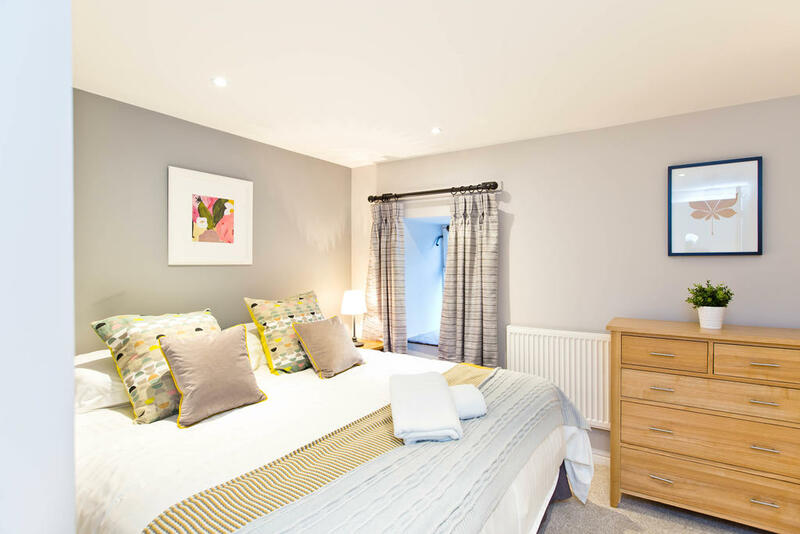 Each property has individually designed living spaces with big comfy leather sofas, solid oak and slate flooring and stylish fabrics and furnishings. If you hire the detached farmhouse called The Grange you have a private games room in the cellar all to yourselves with pool table and a dart board. 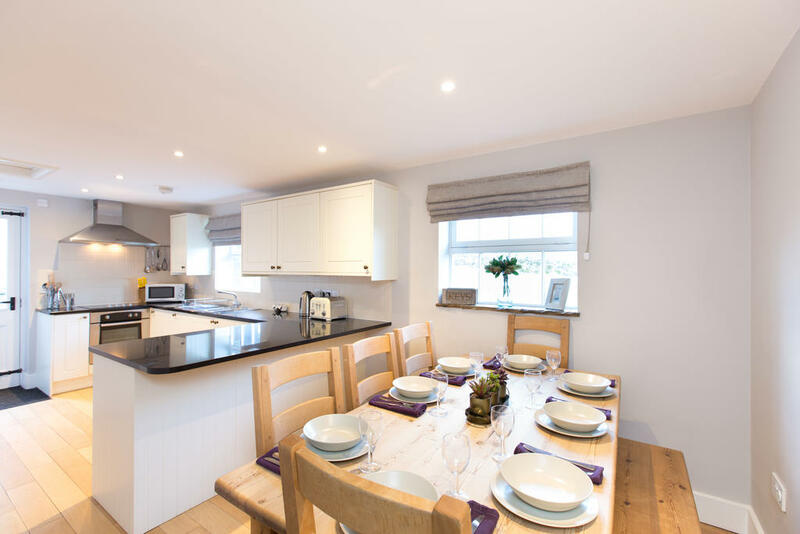 Outside, each property has its own patio and or garden area to sit out and enjoy al fresco dining in the peaceful location with wrap around countryside views and BBQ facilities. 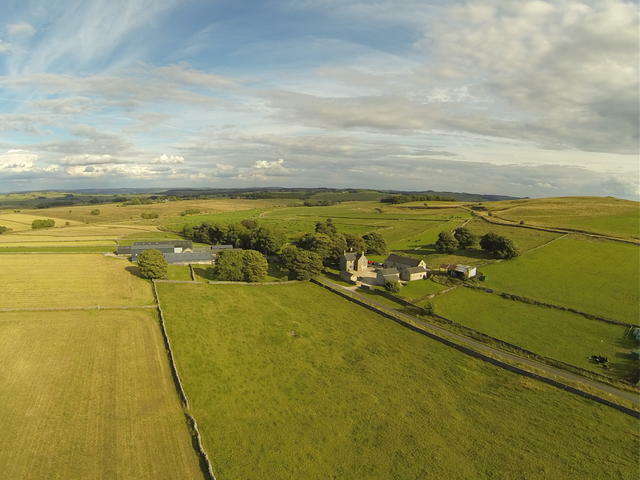 Located in a beautiful rural position making it an ideal location surrounded by this stunning national park. 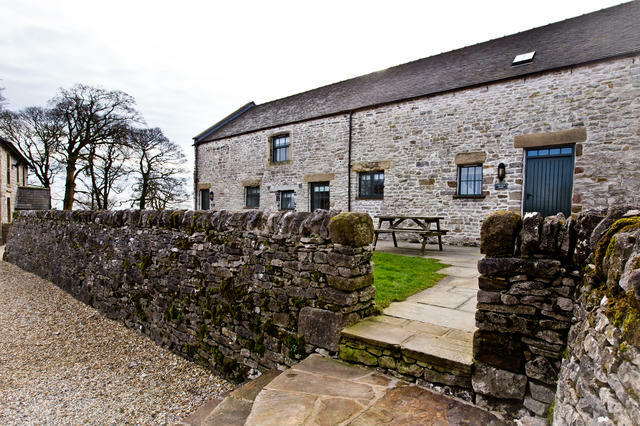 Just a short walk from the very start of the Tissington and High Peak Trail, you can walk and cycle until you hearts content. The famous spa town of Buxton is a short 10 minute drive from Hurdlow Grange, most notable architecture comprises of The Crescent which is modelled on Baths Royal Crescent. 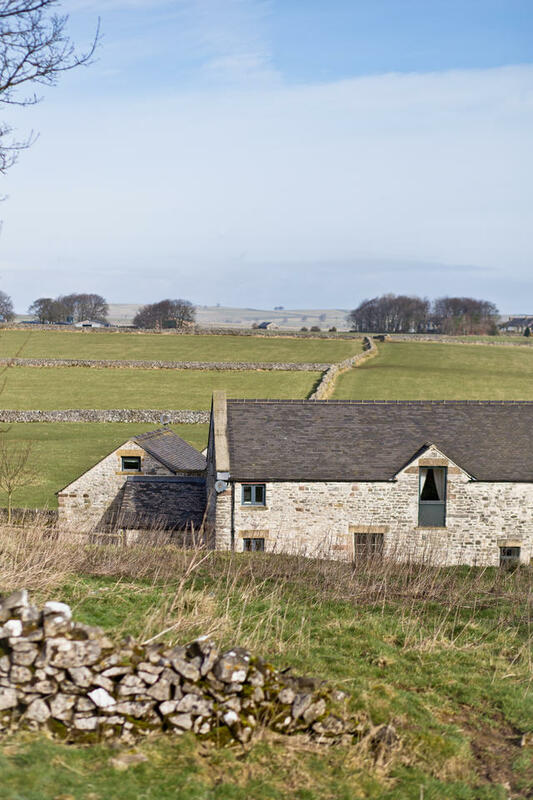 The Peak District offers enchanting villages, historic towns such as Ashbourne and Bakewell and glorious ever changing landscapes are all close by. 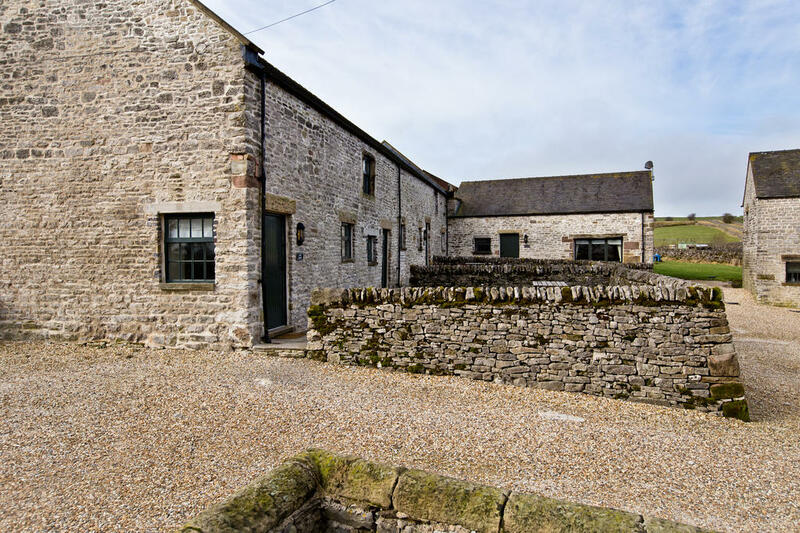 The surrounding area of Buxton you will find the Blue John Caverns, Monsal Trial, The Tissington and High Peak Trail, Go Ape Adventure Park, The Goyt Valley, Dovedale, Chatsworth House, Tissington and Haddon Hall are all within an easy drive. Alton towers Resort provides enough excitement even for the most ardent fun seeker is within a 25 minute drive too. 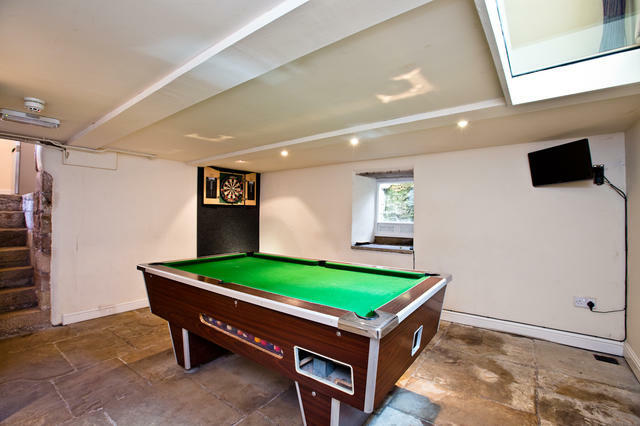 Communal Games Room for the whole site - includes a Table Tennis Table and Table Football. Off the kitchen down a couple of steps is a utility room and WC with stone flagged floor, space to hang outdoor clothing and shoe storage. 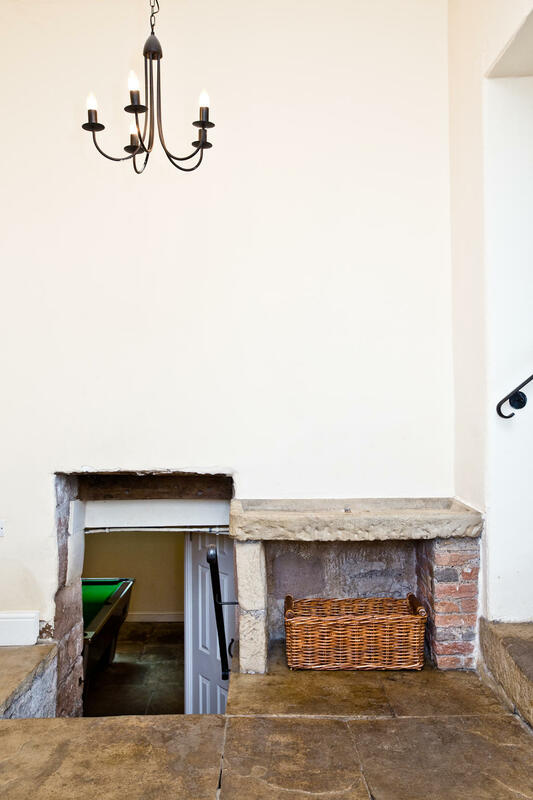 Stone steps lead to the basement which has been renovated to provide a games room housing a pool table and a dart board. 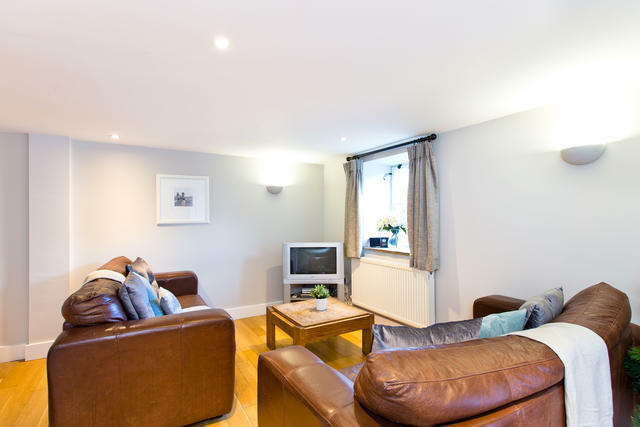 This property is dog friendly allows 2 dogs if pre booked. Please see our dog policy for further details. Should you wish to enjoy a more formal celebration meal during your stay, we can offer additional table leaves (if pre-booked in advance) to dine between 16 and 36 guests. 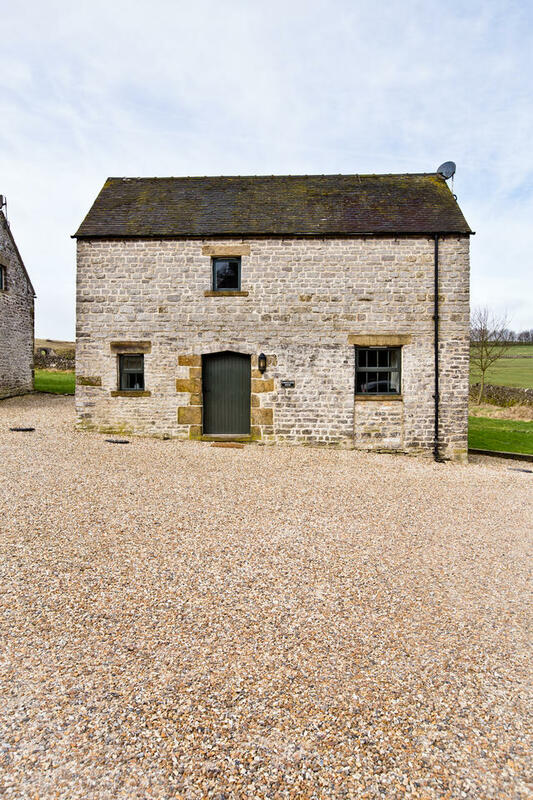 Excellent views of the surrounding countryside to the rear. You enter the accommodation into to the lounge with oak floors and leather sofas (comfortable seating for 6 on the sofas). Open plan downstairs accommodation with leather sofas, granite worktops, oak flooring, original exposed stone wall and large glazed windows taking in views of the central courtyard. 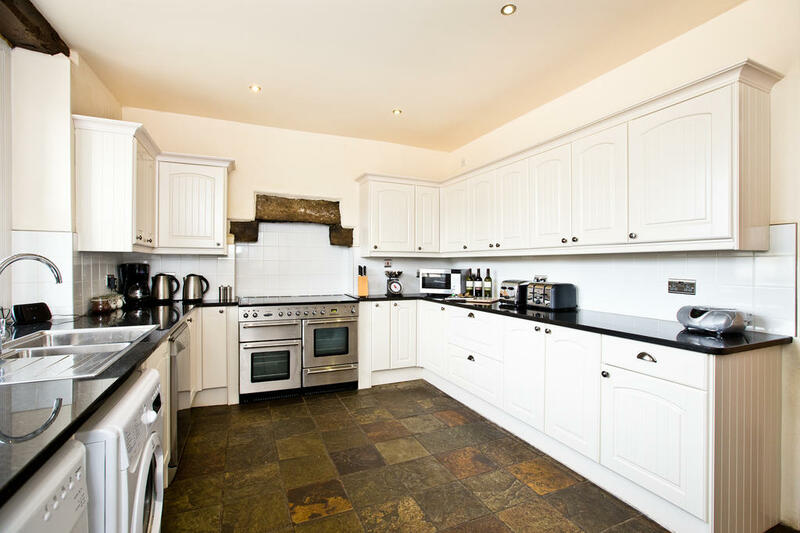 Fitted with a modern style kitchen in a light cream finish fully stocked and well equipped to self cater. 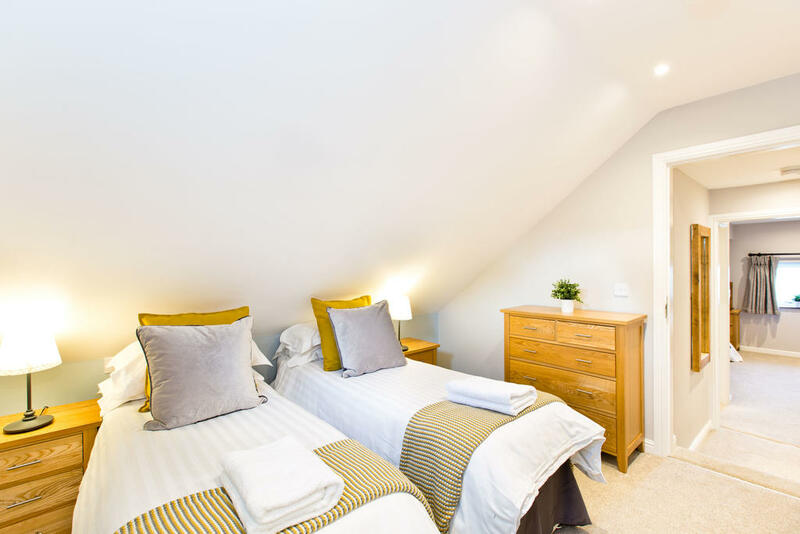 This is a spacious bedroom ideal for families with a small double sofa bed which can accommodate one adult/teen or two young children and an en suite bathroom. There is a patio area for sitting out to the front (for the morning sun), garden to the back (for the afternoon and evening sun) and general use of the grounds surrounding the property's location. 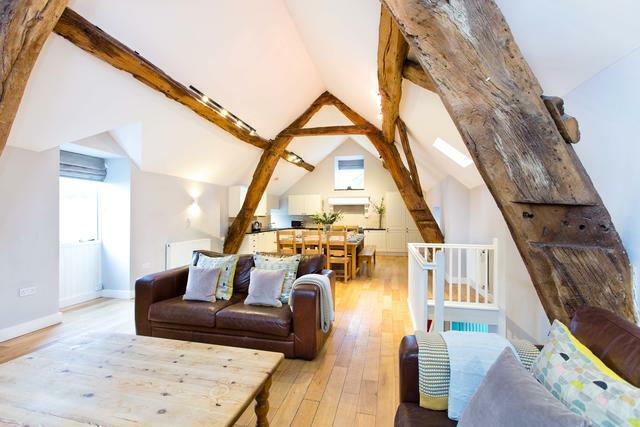 The accommodation has been turned upside down to take advantage of the properties character and views of the surrounding countryside which can be appreciated from the first floor living area. This is ideal accommodation for groups to meet comfortably and get together for those special occasions. Should you wish to enjoy a more formal celebration meal during your stay, your can dine up to 14 guests. Three bedrooms in total sleeping up to 6 guests. 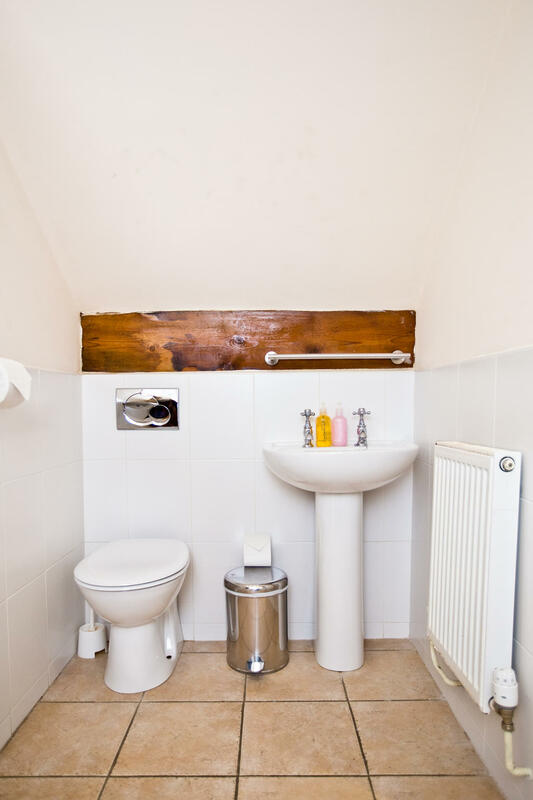 One private en suite and a main bathroom which has a bath with shower above, hand basin and toilet. You have arrived at Hurdlow Grange! The following comments are taken straight from the guestbook we keep for Hurdlow Grange. Verbatim. We had a lovely stay and would love to use Peak Venues again in the future. Many thanks for an excellent weekend, the accommodation was perfect in every detail and out party had a wonderful time. I would like to say that everyone, without exception, thoroughly enjoyed the weekend. The accommodation was truly superb. Where can I start? - Comfy beds giving me the best night's sleep for years. - A huge dining room table around which we managed to get all 34 guests seated. 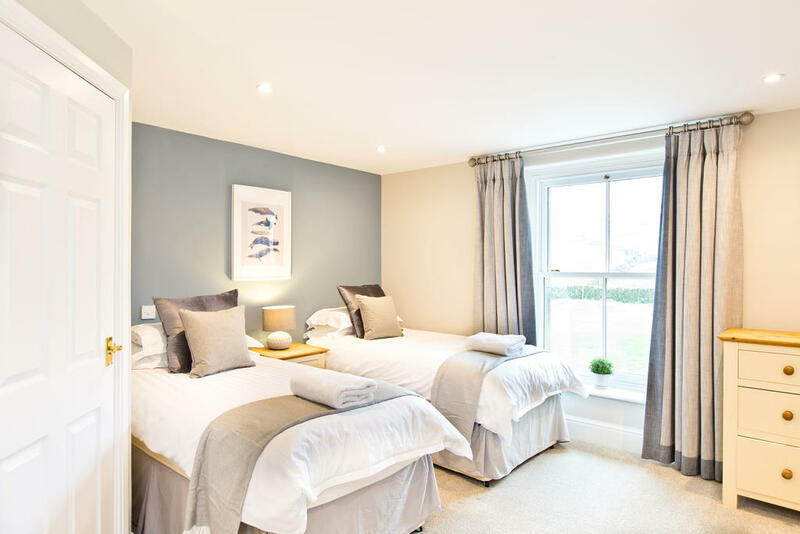 - Kitchens with all necessary appliances, cutlery, glasses and accessories - and made all the easier to manage over all 5 houses by being told when being shown around the houses, that we didn't need to ensure that they were all returned to each individual house! - Everything and everywhere spotlessly clean, and in great decorative order. - Amazing location. The snowfall just added to the magical surroundings. The fact that it miraculously cleared up over Sunday night allowing everyone to get home on Monday morning was a bonus. Thanks again for making my 60th birthday something extra special! We enjoyed our stay very much, thanks. Thank you very much, we were all made up with the accommodation, it was perfect. A good time was had by all. And a Happy New Year! Superb! Accommodation. Excellent week. Good location for walking. Very comfortable. Bloody Brilliant! Thank you very much! Great place you have here! 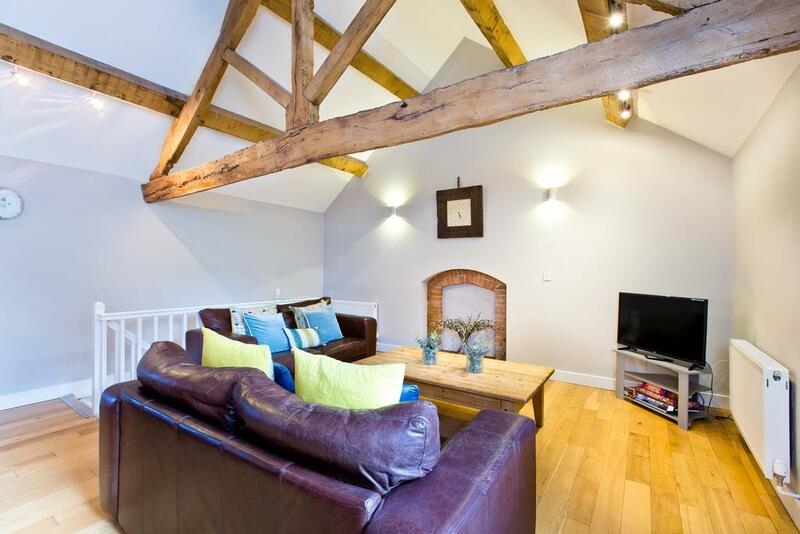 Lovely beams and comfy sofas - we had a superb weekend. Had a wonderful time. Cottages are brilliant, well laid out. Full of character and well laid out. We'd definitely think about coming back. 5 stars! Had a great week even though the weather was a bit windy. New Years Eve was fantastic. But beware of the ghost of the horse that died one time. 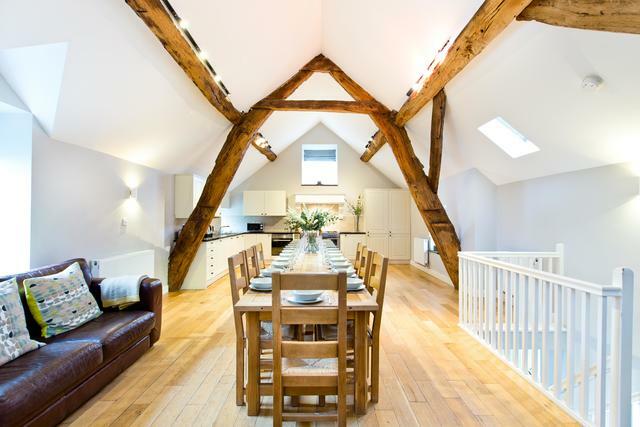 Beautifully done conversion. Tasteful and comfortable. Thank you. 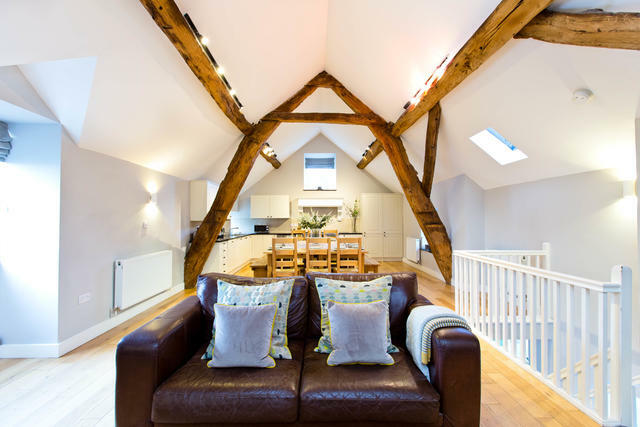 I celebrated my 40th birthday at Hurdlow with around 20 friends and it was great; very comfortable, well equipped and the living space in Cruck'd Barn is fantastic. The lovely space meant we could all sit around and also have meals together comfortably. Everyone commented on how nice it was and it really is how it looks in the photos. We had a great stay and I had a really good birthday. Thanks for a smashing time - this is a lovely location and was just the ticket for a family get together. 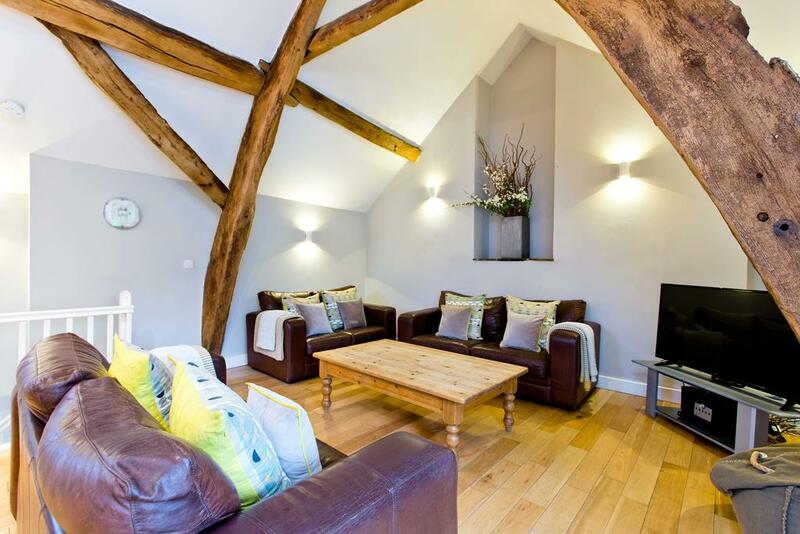 A luxurious place to spend a family Christmas - great facilities in fantastic surroundings. Loved the opportunity to play table tennis. Coasters for the tables may help to protect the lovely wood. 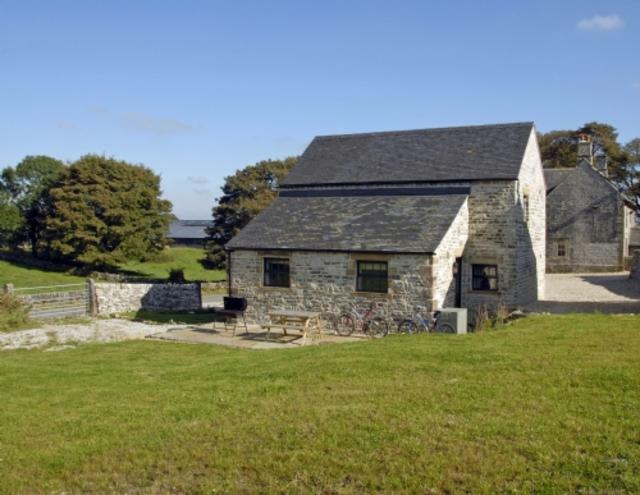 An excellent venue for a relaxing few days in a well equipped cottage. 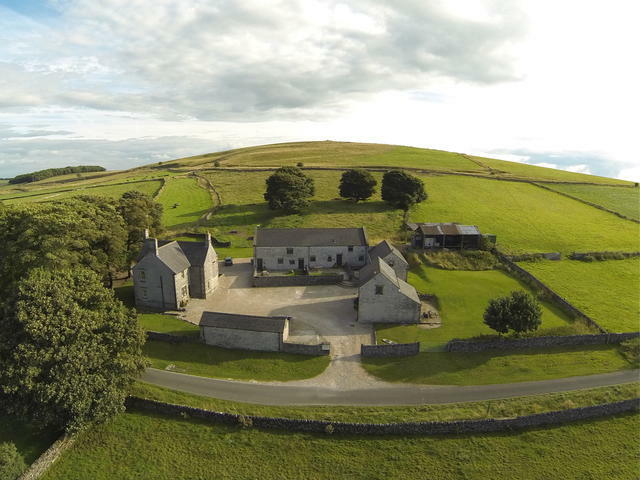 Ideal centre for walking holidays, will be back. Beautiful barn, a pleasure to spend time indoors as well as out doors. A good idea I felt was to have two extra chairs for when large groups of people are in. We wanted the weekend to be perfect for our parents - it was! Cosy and comfortable and well equipped. We'll be happy to recommend you! Best of luck with this place, lots of effort and thought seems to have been put in, it's a top location. Cheers. 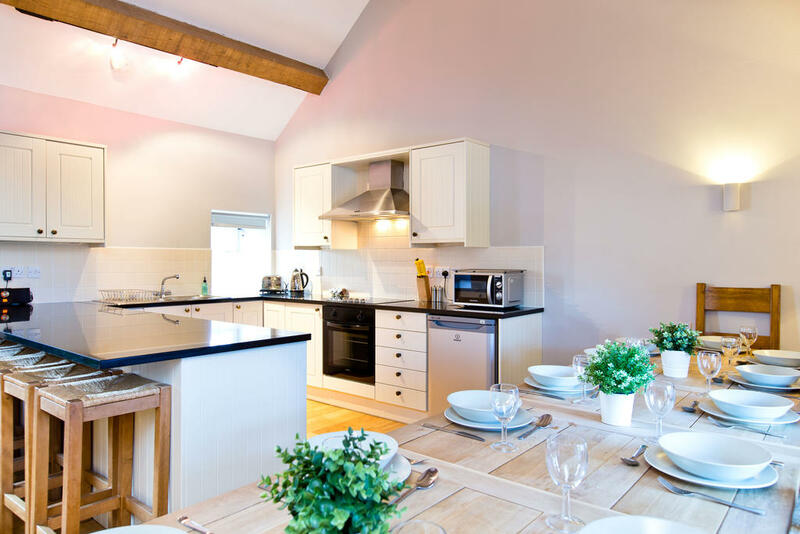 We've thoroughly enjoyed having our Ruby Wedding celebrations in your comfortable cottages. Thank you and good luck with your new venture. Excellent cottages, great games room. A great place to wind down for a weekend! We all loved the cottages and had a fantastic time. They have been beautifully put together and no-one wanted to leave! Thought they were really well equipped and were particularly lovely for a group get together - we were here for a birthday and New Year and it was great that a large group could spend time together so comfortably. We would love to come back. Fantastic venue - superb cottage. V-well equipped, a real 'home from home'. Great to see the 'hunt' as hounds chased the hare through the grounds of the cottages! Special thanks for the seasonal touches of the tree and wine - really appreciated. All the way from Australia for Christmas. Only disappointment NO SNOW!! A really well thought out place to stay, everything feels like it has been thought through , we've had a really good time here! Would deffo stay again! Thank you so much for an excellent weekend. Beautiful cottages & lovely location. All the best. STUNNING! EXCELLENT! LUXURY! PROFESSIONAL! Definitely what peak venues offer with their company, service & properties. 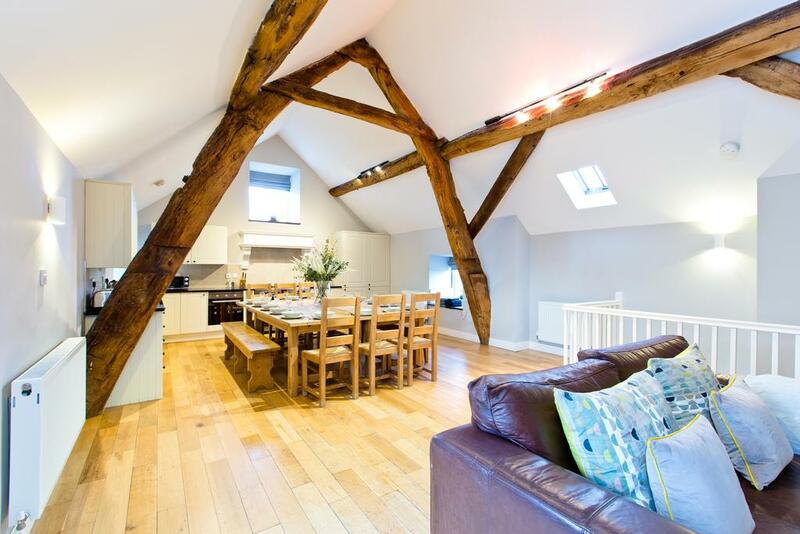 I had struggled to find a property for 20 family for my daughter's 21st birthday, ages ranging from 3-74. Had been e-mailing over numerous properties to peak venues who found this amazing property, we booked The Grange & Bat Belfry it was just perfect! They gave me advise & made the booking so easy to process & response to emails was almost instant. A very professional company that I would definitely recommend to anyone & would definitely use again. 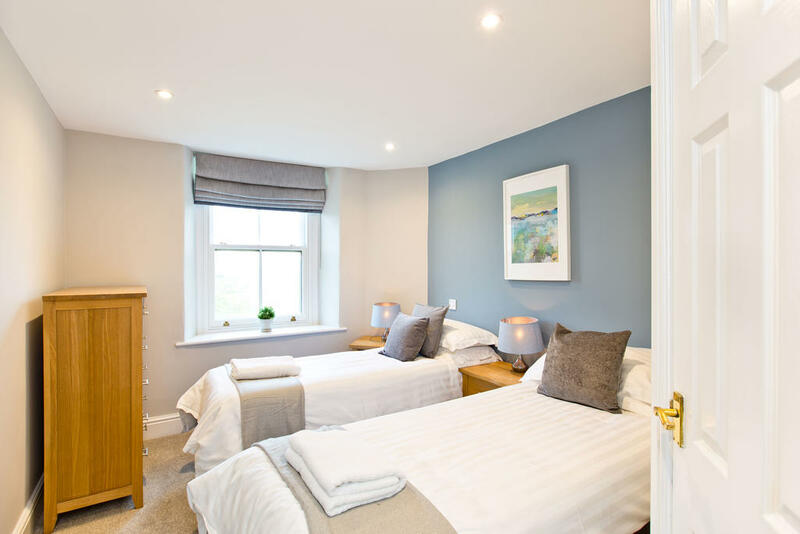 All our party were highly impressed with the standard of finish of the property the lay out of bedrooms all with ensuites & all high quality, with every kitchen utensils, plates, pans, glasses that you could imagine. We ordered a .com delivery which was also recommended by peak venues & also recommend places of interest to visit which we also used. The property was far better than I could of expected from the photos-it took my breath away when shown around on arrival. The property & location just made the perfect setting for a wonderful family celebration that will stay in our memories for a very long time! Thank you Peak Venues. Thank you for a wonderful stay. The property was excellent and we will definitely be returning in the future. Firstly thank you all very much for the fantastic stay we had. Rest assured trip advisor will get a glowing report from us.The Royal Oak too went above and beyond on four separate occasions. Hopefully I will have chance to stay with Peak Venues again in the future. It has been very organised talking with you and your friendly colleagues and the stay was lovely. A good time was had by all. The Grange was comfortable and very well equipped. The game's room was particularly popular. The only down side was the damp weather but we can't blame you for that. Hopefully we can do it again. Thank you for the return of the damage deposit, received to my bank account this morning as promised. I have had emails and letters from nearly everyone in the group expressing their appreciation of Hurdlow and all its facilities. We were very comfortable, as we were 3 years' ago and the weekend went very well. Your efficiency and the pleasant manner of all the staff helps when making the arrangements involved with such a gathering of 20 people from all over the country, so as the main organiser, I would like to thank you once again for your co-operation over all the transactions. Thank you for the excellent accommodation which fulfilled the needs of 13 ‘middle-aged gentlemen’ (as we seem to have monickered ourselves) to everyone’s expectations, and beyond. 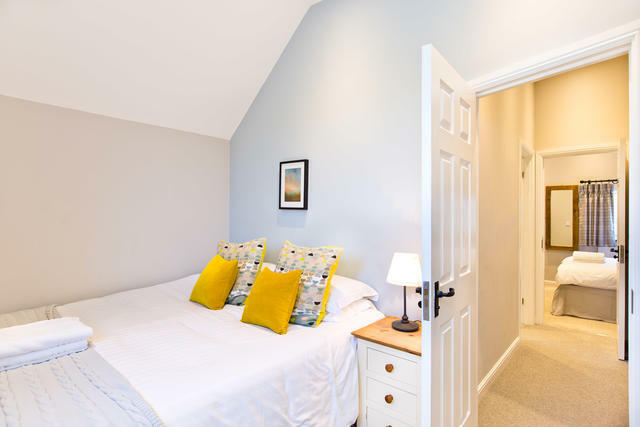 We all had a very enjoyable weekend of walking and were very pleased to be able to return to the comforts of Hurdlow Grange at the end of each day. We were especially grateful (if not surprised) at your efficiency that allowed the first arrivals to enter the property at 12.30pm. We had a wonderful stay thank you. It was brilliant! Both houses were beautiful and we had a wonderful time, thank you! We had a very enjoyable stay at Hurdlow Grange and would recommend it to our friends. 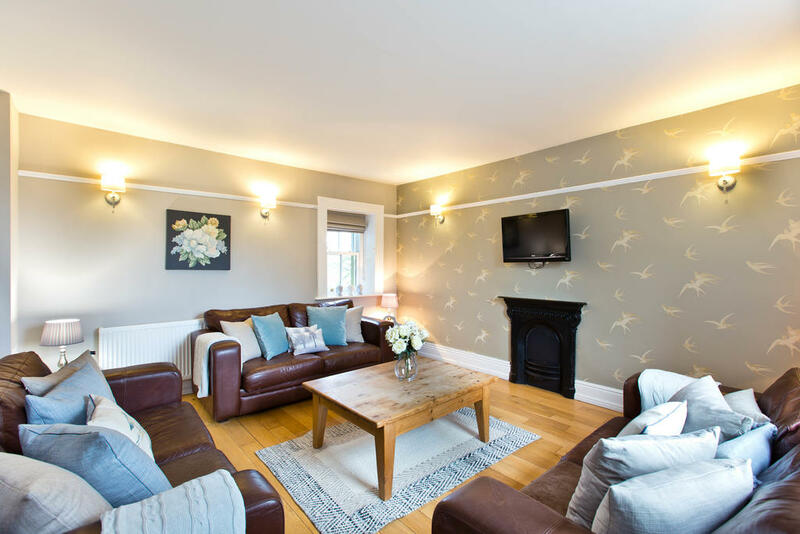 We all enjoyed our weekend at Fairfield House - it was an ideal location for us . A lovely area & excellent accommodation! We had a fabulous stay. Thank you very much. Just wanted to say we had a great week in the Cruckd Barn (and Amberley House). The accommodation was good with plenty crockery etc. Perfect for our large group. The beds were comfortable and the showers had good pressure with plenty of hot water. Any queries we had were quickly dealt with. We enjoyed our meal at the pub and had used Gourmet Express to deliver a meal it was excellent. We would recommend Peak Venues to others whether a big group or a small family. We loved the accommodation and all said we would love to come back there again some time with our partners. I would like to thank you for the rental of Hurdlow Grange which we all thoroughly enjoyed staying at. Thank you very much, we really enjoyed our stay at cruck'd barn and amberleigh house. We had a fantastic time at Hurdlow. I will try to make time to write a review. 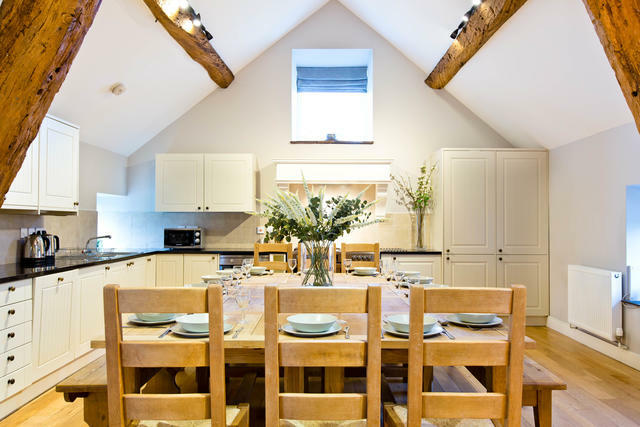 The cottages were perfect, they are stunning and were fully appreciated by all guests. It is a perfect venue for large groups. I would recommend Peak Venues and would like to thank you very much for all your help with our weekend. Thank you for your email. We had a great weekend at The Grange and thought the accommodation was fantastic, suiting our needs perfectly. 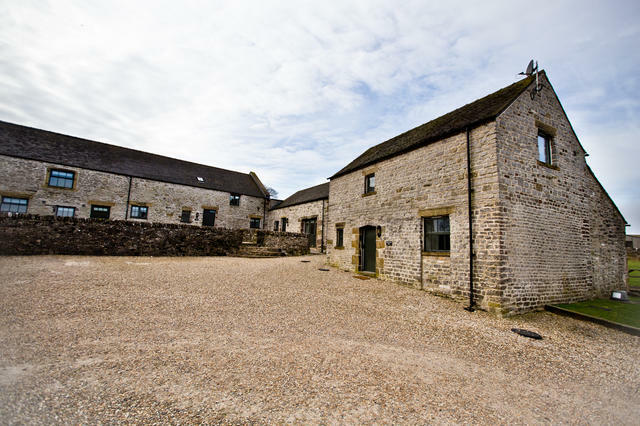 The group commented on how well equipped the property was and how you had thought of everything we could possibly need for a group weekend away. The property was spotless and comfortable, we particularly enjoyed spending time in the redecorated dining room. The property and surrounding areas were beautiful and I would recommend the property in the future. Throughout every step of the booking process from my initial enquiry to checking out, everyone at Peak Venues has been incredibly helpful and it has been a pleasure organising this weekend with you. Thanks very much we enjoyed our weekend so much! The food and service at the Royal Oak were amazing too! We all had a fabulous weekend at Hurdlow Grange and loved the property. We will definitely recommend it to family and friends. The stay was fabulous thank you I love the cottage! Thank you very much for allowing us stay at Hurdlow Grange. The cottages made the perfect setting for us to celebrate our marriage with friends and family. We used The Grange for a takeaway evening and pool tournaments, Bat's Belfry to spread out our cards, gifts and display our cake as well as Champagne for everyone, used Cruck'd Barn for a buffet and actually had the blessing on the patio'd area outside Bat's and Cruck'd. We were really lucky to have had good weather for the weekend too. We went for a walk on the Sunday which finished at the Royal Oak for Sunday Lunch. The meal was the 3rd we'd had there that week! The service was great and meal was lovely. 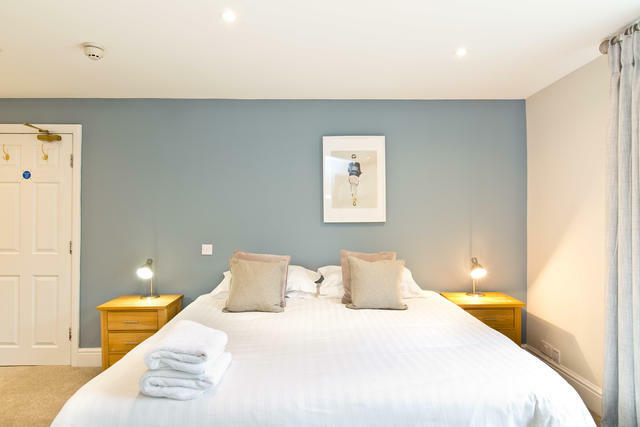 The staff we met on site at Hurdlow Grange were very nice too - mainly the cleaners, who were all very helpful and kind, and did a brilliant job as the cottages were all very clean and homely. 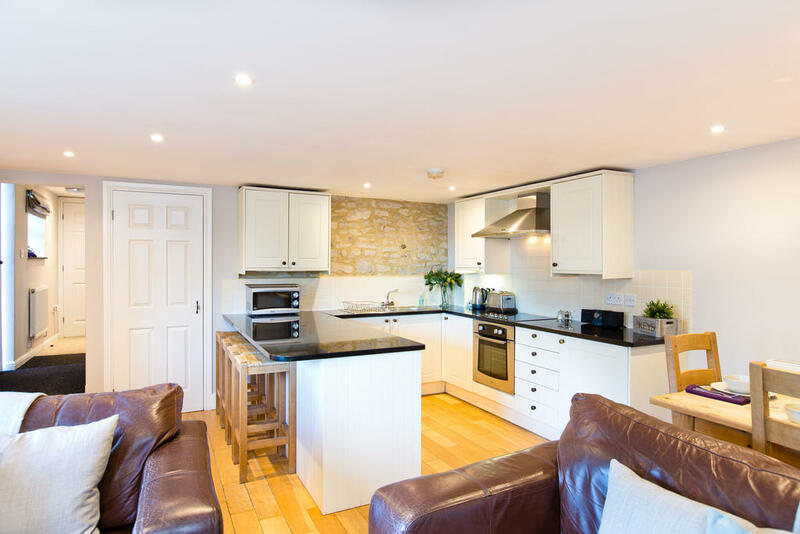 We did check through each cottage before we left, and were pleased to see for ourselves that our guests had left the cottages as they found them, and I hope you found this to be the case also. We had moved some bowls and glasses from other cottages, but explained this to the cleaners when they arrived so we could assist to take them back if required. We really couldn't have asked for a better venue and the feedback from our friends has all been positive. It was great! Can't complain about anything. Thank you. We had a wonderful time and we were very grateful that the houses were so nice, and that the tables had been moved. Organizing 14 people can be difficult, but it all seemed very easy with your support. Thanks, We had a lovely stay - didn't want to leave! I'm sure we'll be back next year. Thanks for another great weekend up at Hurdlow Grange. The Guys enjoyed it so much that they have asked me to book it all again for next year. Also please thank both Josh and Mark, and all the lovely staff at the pub for two evenings of scrumptious grub and beer. 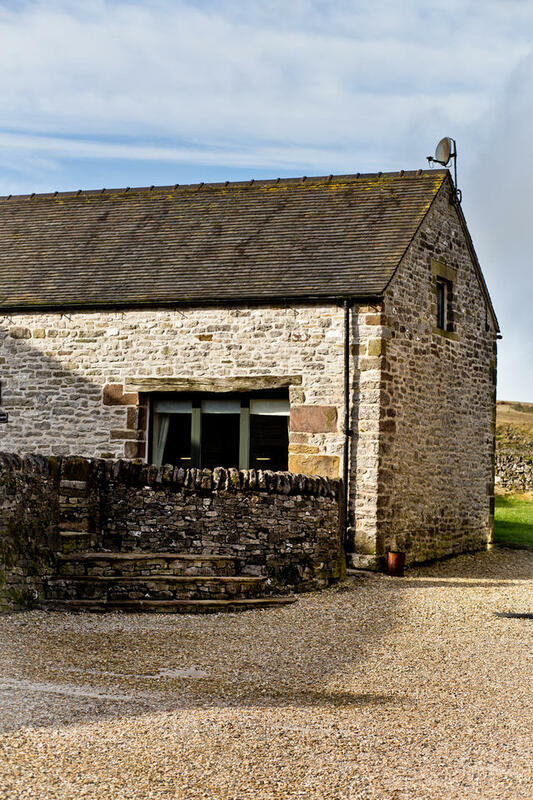 Thanks, we had a great time at Applegarth and in the Peak, and thought it was a lovely property. We enjoyed a great week at the Grange celebrating our Golden Wedding. Everything was in first class order and catered for our needs splendidly. Many thanks again - we would definitely love to stay again. Thank you for the experience, we had a wonderful weekend, helped by the glorious weather. We celebrated my birthday in style both at the house and the Royal Oak, will certainly recommend it. Many thanks for your email. 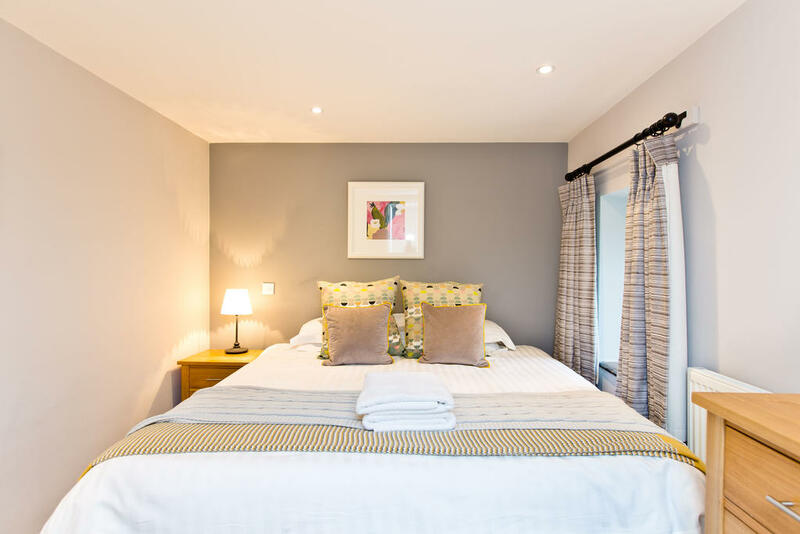 We had a fantastic weekend at Hurdlow and were extremely impressed by the quality of both the cottages and the food and service at the Royal Oak, many thanks to all of your staff. 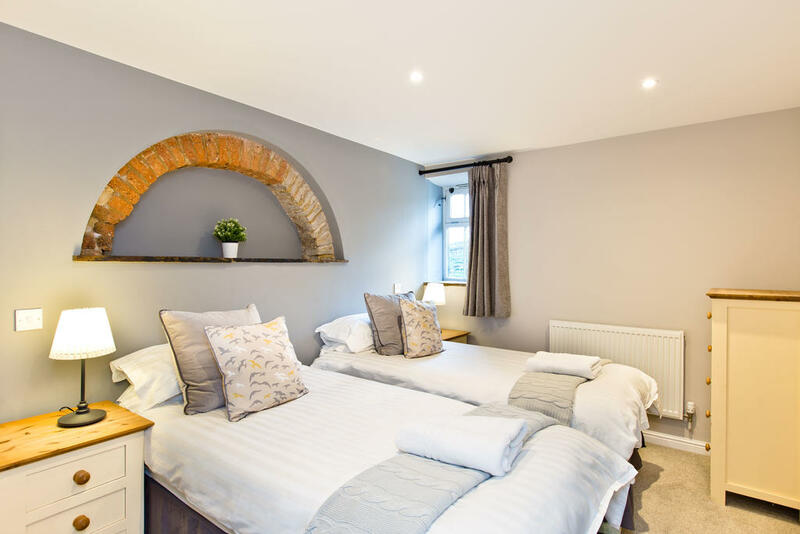 We had a great time at Hurdlow Grange and the cottages were more than we expected and would definitely recommend them to anyone. We hope to return in the future. Many thanks. We had a truly fantastic stay and lots of the girls will be contacting you to book up for their families in the coming year ! We did enjoy our stay, and the food at the Royal Oak! Excellent accommodation, absolutely loved our stay and the meal at The Royal Oak on Sat night. Our stay at Hurdlow Grange this past weekend was amazing, thank you so much, you have a beautiful properties there. 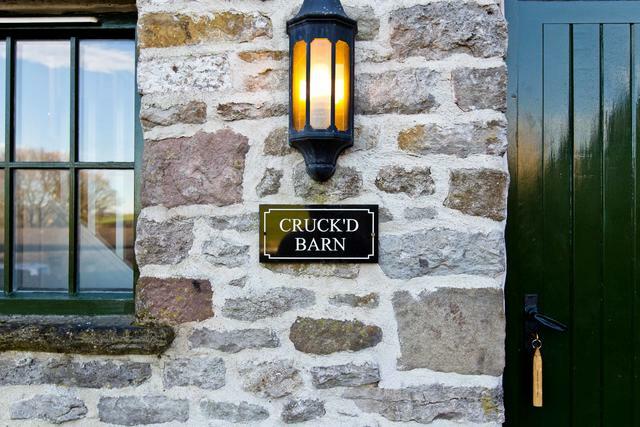 We all thoroughly enjoyed our stay at Cruck'd Barn. 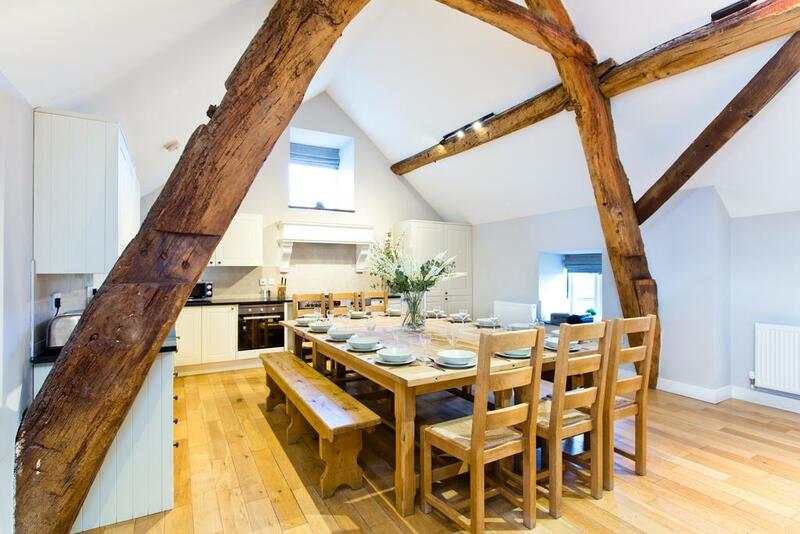 The Barn was just what we wanted as a group of 8 with the long room combining as kitchen, diner and sitting room being just the ticket. 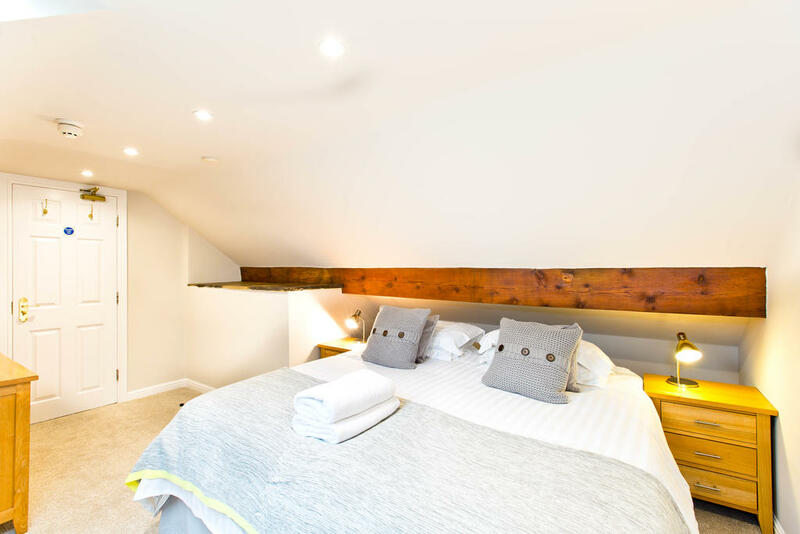 We all thought that the Barn was very well equipped with nothing missing and we appreciated the clean, modern, well presented interior, very comfortable beds and excellent showers. 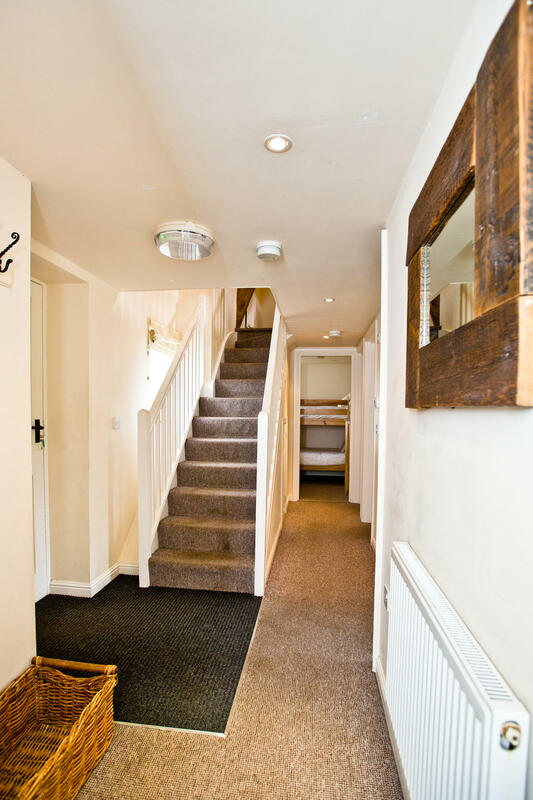 All in all a very positive impression of your property and its location from all of us. Thank you. I just wanted to thank you for the most wonderful accommodation abs help with regards to my husband surprise 40th in Feb. It was just perfect! The venues were all absolute spot on and beautiful, well equipped and spectacular location for scenery, walks and the fabulous Royal Oak who again were so accommodating for a large group. 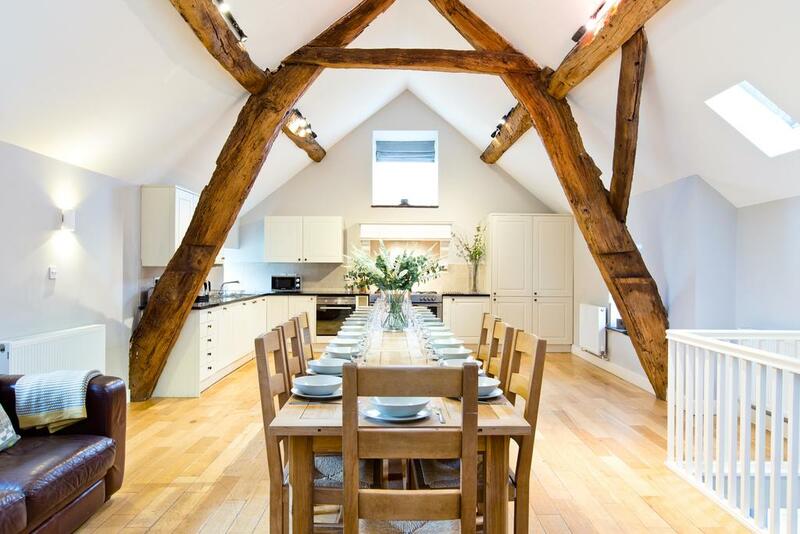 The Cruck'd barn made the most perfect host for its fantastic large kitchen table where everyone congregated and made it really wonderful to be together. Thank you, highly recommend!! Thank you for an amazing stay!! 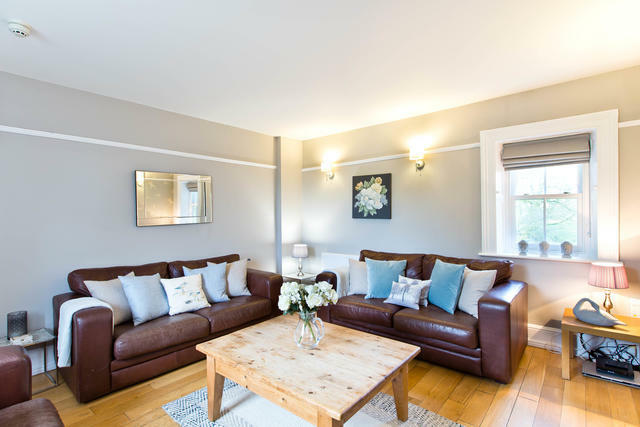 we all thoroughly enjoyed ourselves and the house was fabulous and suited our needs perfectly! Hopefully we'll be back again! 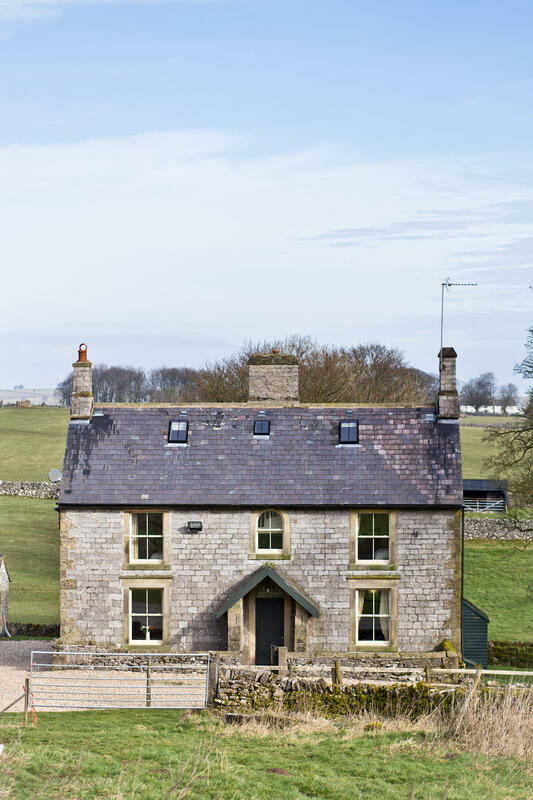 We had a brilliant time at the weekend staying in Bats Belfry and Applegarth: the accommodation worked a treat in terms of us being able to eat/socialise together in Bats Belfry and the close proximity of the two cottages didn’t cause problems at all. It was made all the more special by the snow!! Several of our party travelled from the south of England and rarely experience snow so we had extra fun building snowmen, making snow angels and having snowball fights! We also had an excellent evening/meal at the Royal Oak on Friday evening. We all wished we could have stayed for an extra few days and wouldn’t hesitate to come again. Thanks very much for having us, we thoroughly enjoyed it. Thanks very much. We had a wonderful weekend and were very impressed with Hurdlow Grange and would like to return in the future. 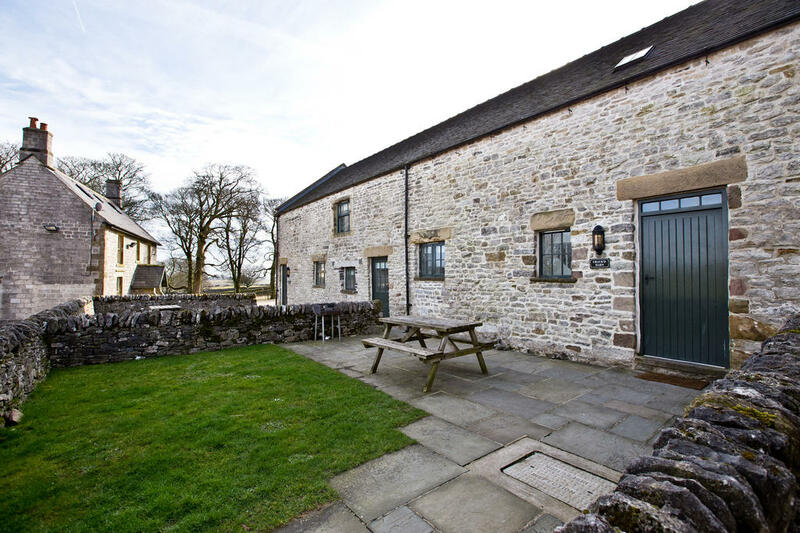 It was an ideal place for our break and we felt the cottages were very well equipped. We also very much enjoyed our meal at your pub. Thank you very much for a lovely weekend stay at The Grange. We really enjoyed our visit. I just wanted to say a huge thanks for the stay we had a Applegarth this weekend, what a fantastic group of cottages you have in an idyllic location. 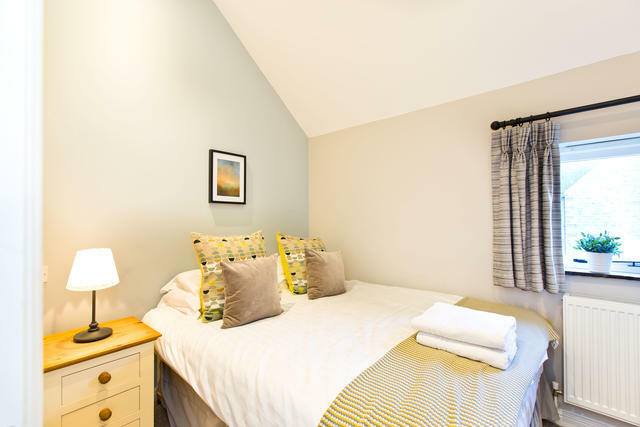 The cottage itself was fantastically equipped, very clean and the little touches such as towels, soap, shower gels and cleaning materials really showed you had thought of everything, and often things that people forget! We ate in the Royal Oak on Saturday night and the food and service by the staff was excellent. 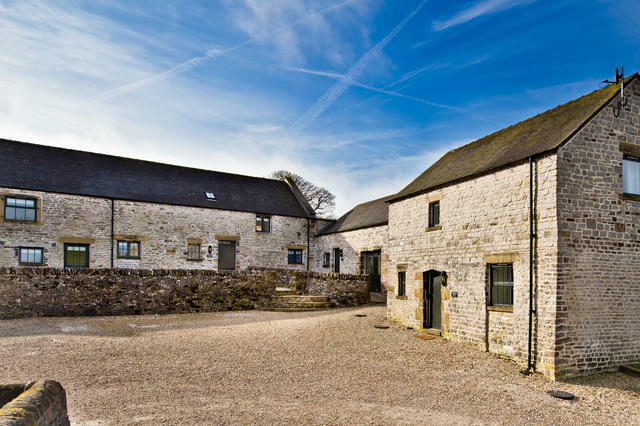 I feel its a great unique venue for corporate groups who want to be away from it all- be together for working/ socialising- but also have the luxury of having their own space too without being confined to a hotel bedroom. We couldn’t fault anything, I will have no hesitation in recommending Peak Venues. Many thanks again Rachel, we will be back! We had a great weekend.We had a great time and will be back. We enjoyed our stay and found the accommodation perfect for what we were after. 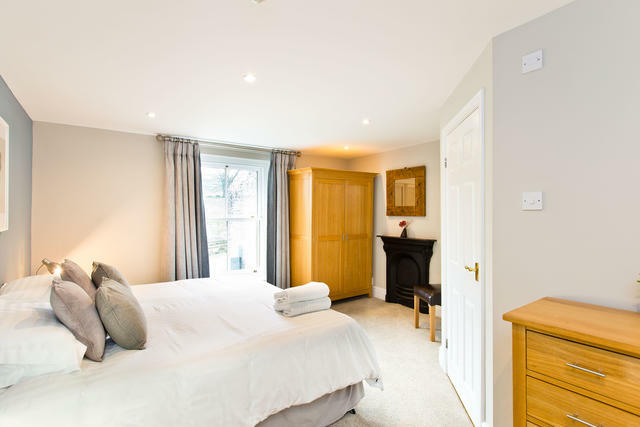 We thoroughly enjoyed our stay there and I would certainly consider staying again in the future. Thank you very much we all loved staying the weekend and had a great time! The weekend was a huge success and worked really well for our family’s 60th birthday celebration. We thoroughly enjoyed our stay in the Cruck'd Barn and found that we had everything that we could ever need and more! 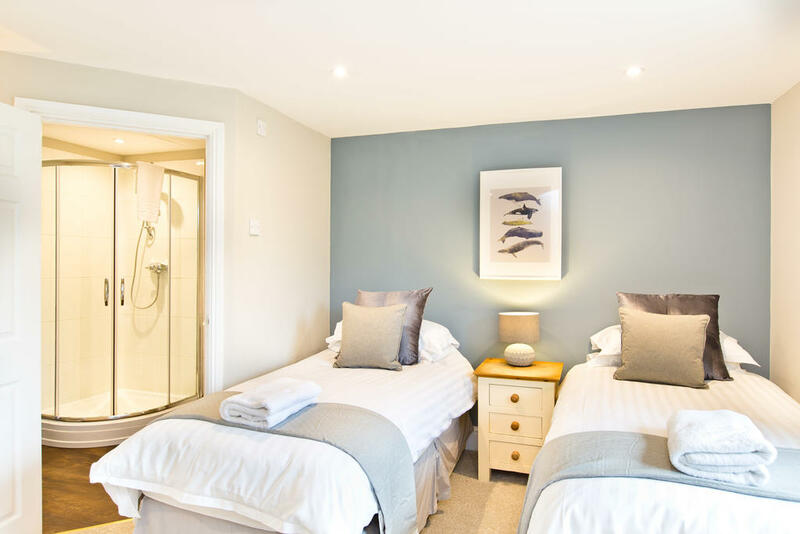 We were very pleased with all aspects of the stay of my family at Hurdlow Grange and the high standard of all the facilities. The sole exception was the weather but we cannot hold you accountable for that! Both Josh (who showed us to the Grange) and Paul (who manages the estate) were friendly and helpful. Thanks for this weekend. We had a great time. The Grange was a wonderful holiday home for our annual extended family holiday. One of the nicest we have visited over the years. Thank you for helping us towards a fantastic weekend celebrating my Grandma's 80th birthday. We have had an amazing time at Hurdlow Grange. Taking over 3 properties we had plenty of room for 20 and were easily able to all eat together. The properties were all well stocked and the little extras, hand soap, shower gel, bin bags, dish washer tablets, tea, coffee etc were a welcome change from other properties we have stayed at in the past. Having the ability to choose the bed set up (singles instead of doubles) was really helpful. The views were beautiful and the area peaceful and secluded. The pub at the end of the lane was great, excellent food and wine and able to cope with large groups. Thank you so much for a great weekend. Great weekend. Loved the place. Can't rate it more highly. We've just arrived home in Singapore, and I want to thank you so much for everything you did to make our stay so lovely. We loved the accommodation and everything your team did to look after us there, including the amazing team at the Royal Oak. 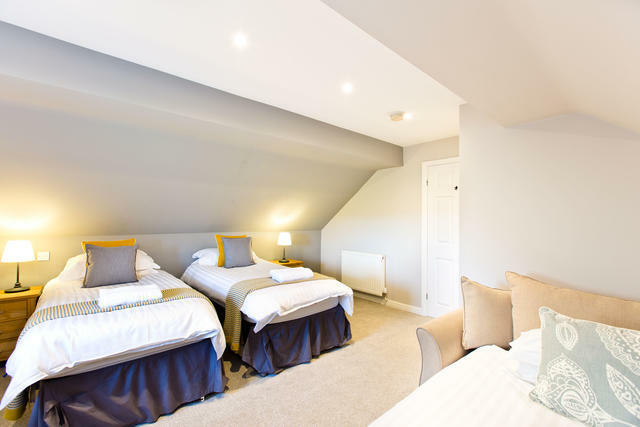 I have made a review on Trip Advisor and will definitely recommend Hurdlow Grange to others. We had a great time at Hurdlow, so thank you. 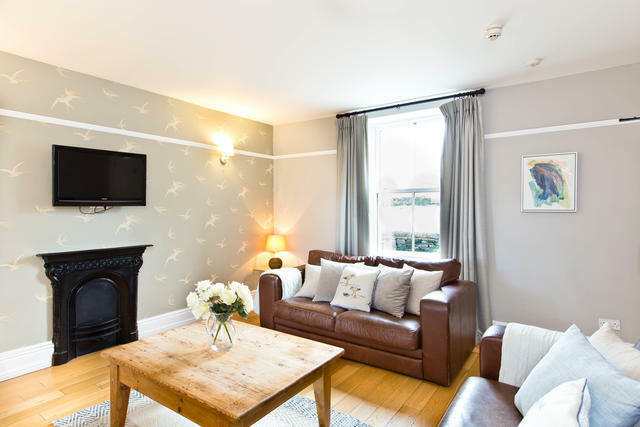 We really enjoyed our stay - beautiful property, we especially appreciated the large social area on the first floor and comfortable sofas. We had a very enjoyable week staying at the Grange & good weather too! We had a great weekend away! We very much enjoyed our stay at Hurdlow Grange, so thanks to you and your team. Many thanks. 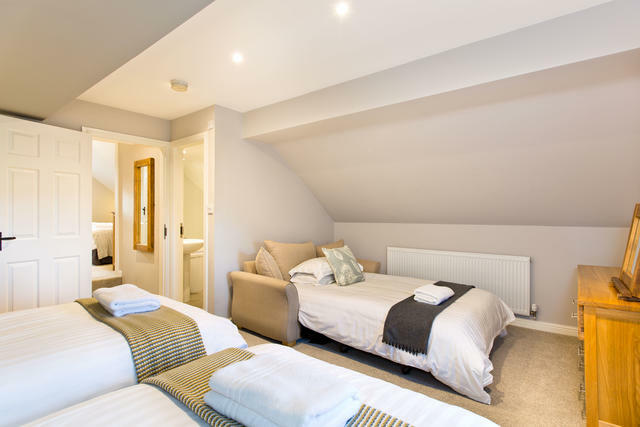 We enjoyed our stay very much and were very pleased with the facilities at Hurdlow Grange. We had a wonderful week at Hurdlow Grange - a mixture of friends and family, walking and celebrating. The house was perfect and we will certainly use it again. We enjoyed our stay with you very much and had some lovely walks and great family evenings. Hi thank you for a fantastic stay… I will put a note on trip advisor but couldn’t have enjoyed the weekend any more than we have. The facilities you have and the venue your top standard. We had a fabulous stay at Hurdlow Grange Thankyou and especially enjoyed the great food at the pub. We will definitely recommend the place and will look to book for future family gatherings. We all enjoyed our stay very much. It was a perfect venue for our university pals get-together. Thoroughly enjoyed our time at Hurdlow Grange. Everyone in our party was of the opinion that it is one of the best venues we have stayed at to date. Thank you for your excellent communication. Will definitely recommend your venues to my friends and family. Many thanks for a wonderful weekend. I will highly recommend Hurdlow grange. We very much enjoyed our stay at the cottage and will hopefully return in the future. 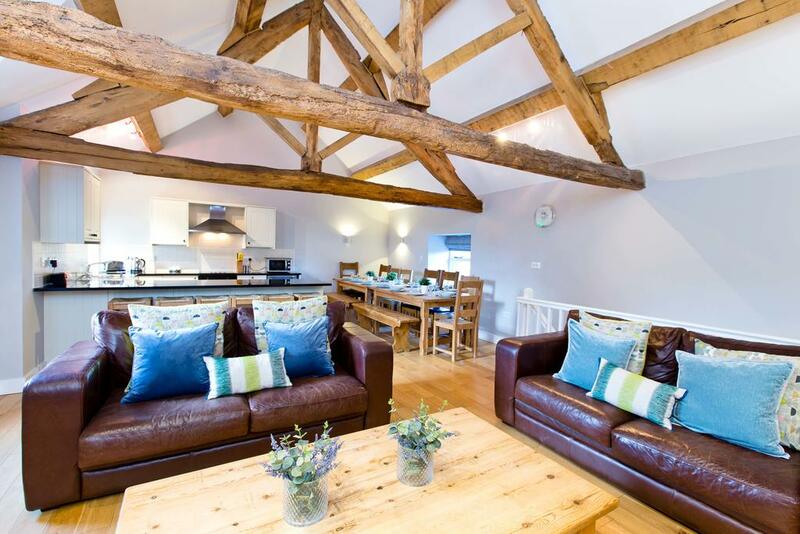 Everyone had a lovely stay at Cruck'd barn and we will definitely be returning! We stayed in such lovely accommodation which catered to all our needs. We will most certainly be back again in the future. We all had a lovely time on the weekend, thank you from all of us! I will most certainly keep you in mind for future trips. We had an amazing time and only wanted it to be longer! 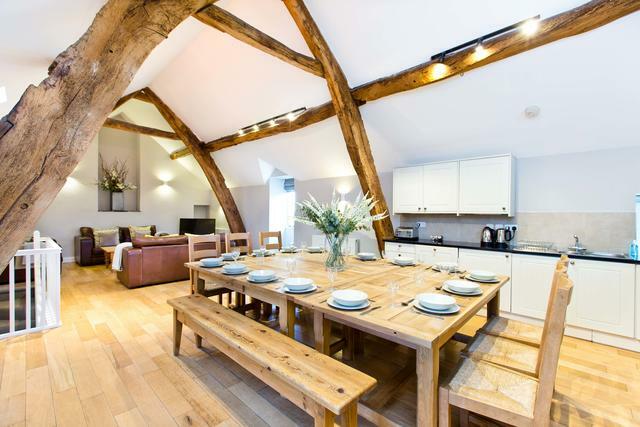 Your accommodation in Cruck'd Barn was first class. Loads of room for the 8 of us and the dog. :o) We enjoyed a beautiful meal at the Royal Oak as well - delicious. 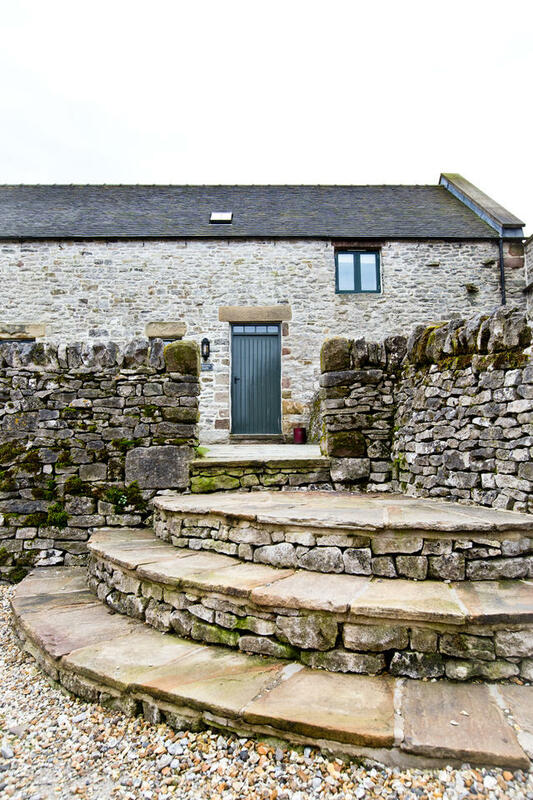 Great location, ideal for walking from the front door or to travel deeper into the White and Dark peaks. We have been recommending you to all our friends. 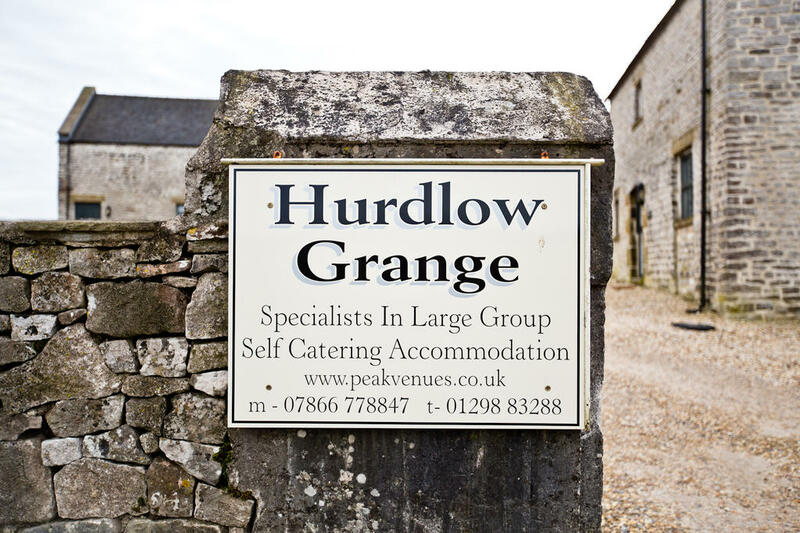 We had a very enjoyable stay at Hurdlow Grange and It was a great base for us to explore the Peak District. Hi the accommodation as last time was great and service by owners and staff at pub and via phone very good pre trip. We had a great weekend at Hurdlow Grange. Many thanks, especially to the staff at the Royal Oak who made us feel so welcome. Thank you for your email. We did enjoy our stay at Hurdlow Grange. We thought it was excellent and I will recommend on Trip advisor. I hope we may come and stay again sometime. Had a fabulous time! Can't wait to come back again in future! Hi Paul Thank you very much for all of your invaluable help in organising our Christmas party over the weekend – not just in terms of the services offered by Peak Venues, but the help in sourcing food and drink for the accommodation, coaches etc. I think that I speak for everybody when I say that we had an amazing time – it was exactly what we wanted. The cocktail making was a real ice-breaker (no pun intended!) and really set things off. Everything worked very well – excellent food, plenty to eat and drink, lovely venue which helped create a really relaxing, informal party. Please pass on our thanks to everybody involved. Thanks once again! Thanks for the week, it was amazing. Thank you. 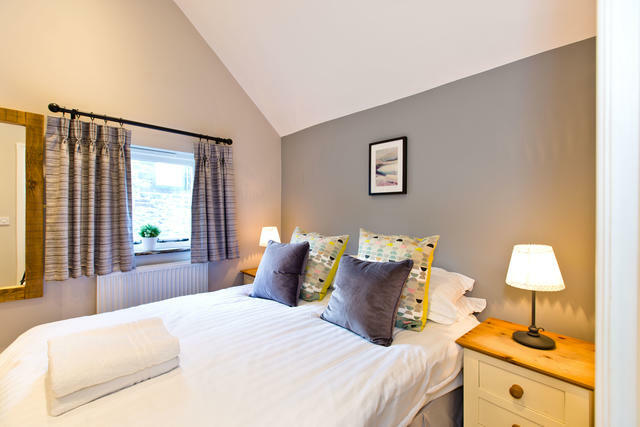 We enjoyed our stay at Applegarth very much and the food at The Royal Oak was superb!. We have just returned home after our weekend at Hurdlow Grange. 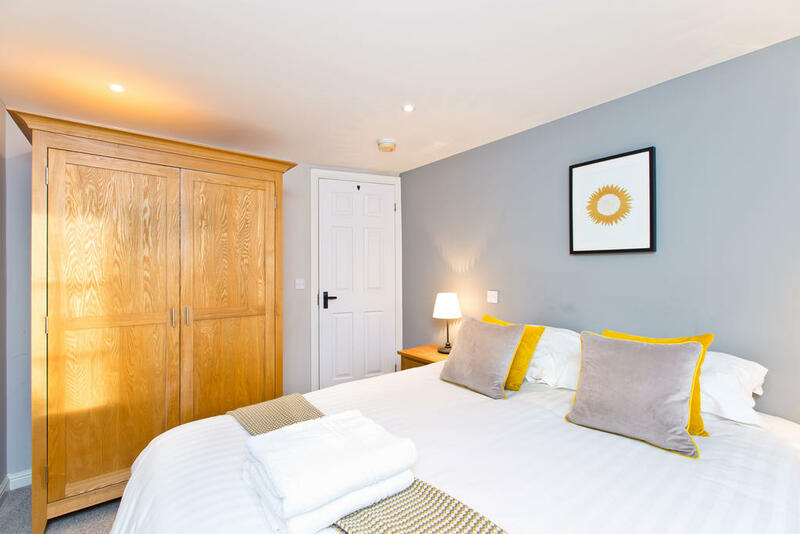 The venue was perfect for our needs, exceedingly clean and well equipped and your staff have been courteous, friendly and extremely helpful throughout both the booking process and the weekend itself. Dom even took delivery of an unexpected parcel of helium balloons on Saturday afternoon while we were all out enjoying ourselves! The weekend was in honour of my mother's 90th birthday, the highlight of which was to be a fully catered celebration dinner on Saturday evening. Much to our dismay The Dinner Party Company, suddenly pulled out approx 3 weeks before the event. I must say, though, that your staff bent over backwards to try and help us find someone to replace The Dinner Party Company, not an easy task with only 3 weeks notice! After countless hours on the internet and approx 20 phone calls, I eventually contacted Tracy Stewart of Dining In Catering and I had to take a punt on her. Well, it certainly paid off - not only was she available on the required date, she rose to every challenge thrown at her, which included a guest with severe food allergies, and 5 very wet and muddy men with bicycles traipsing through her workspace shortly before she was due to serve! Nothing fazed her, nothing was too much trouble, and she produced a meal of outstanding quality at a very reasonable price and turned a near disaster into an absolute triumph! I would certainly not hesitate in recommending her and her staff to your future guests. We lunched at The Royal Oak on Sunday and again, they could not have been more helpful. The mulled cider was particularly appreciated after a somewhat wet and windy walk down the lane from The Grange, and the food was delicious. To say that the portions were generous would be an understatement - even my hungry hordes were replete afterwards! Proper pub grub in a proper pub! I don't think anyone managed another mouthful for the rest of the day! Thank you yet again for a wonderful weekend which even the atrocious weather could not dampen. Whilst the occasion had been a family get together in aid of my mother's birthday, the family are already talking about repeating the visit for a family reunion next year - but if you could lay on a little sunshine next time, it would be greatly appreciated. Well done Peak Venues. Many thanks for your email, I was just about to send you one thanking you for a lovely stay, we fell in love with Applegarth and have only nice things to say about our visit thankyou. We had a lovely stay in the cottage and a great meal at the pub, thank you. Cannot think of enough superlatives to describe our stay. Suffice to say that we all had a wonderful time. We loved the house since it was so warm, comfortable and well equipped. We had a lovely meal in the Royal Oak pub on Sunday and food delivered by Gourmet Express on Saturday which was also very nice. The information folder was very useful, and we loved the surrounding area. This was a celebration weekend for my husbands 60th birthday and it was absolutely ideal. Thank you so much. We all had a fabulous time, the accommodation worked well for our group. The Grange was well equipped and there was ample parking . 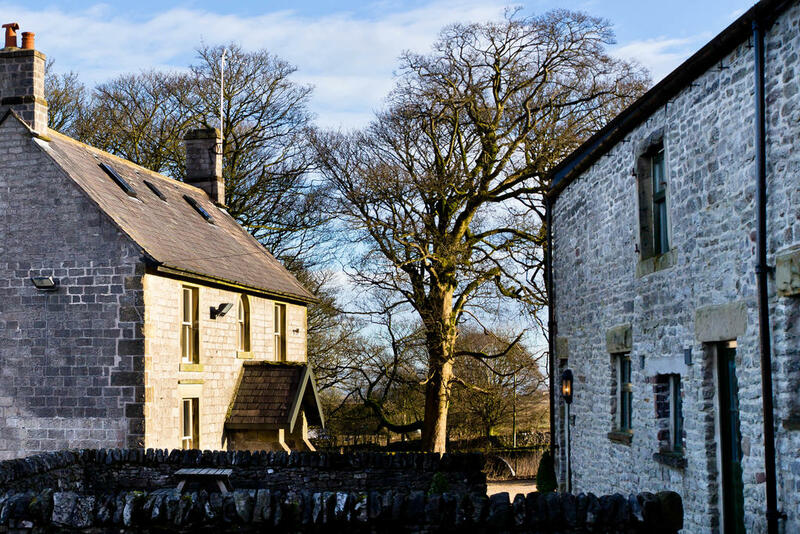 It was ideal to be able to walk directly from the accommodation and to have The Royal Oak at the end of the lane for a refreshing drink on the return. 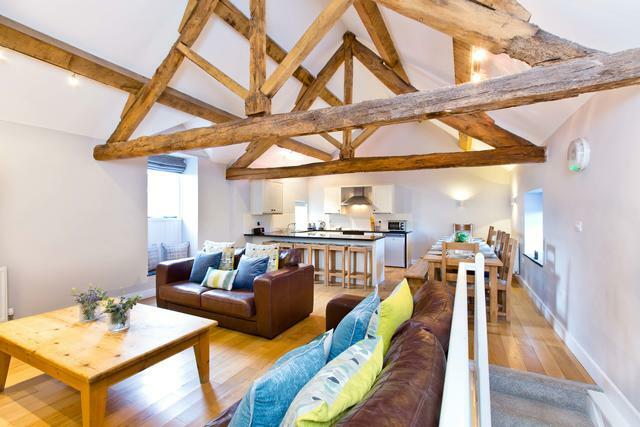 We would love to return or stay at one of your other large properties in the future. Everything worked so well from the initial booking process through to our departure. We had an amazing time in beautiful surroundings. We all had a fabulous time, the accommodation worked well for our group. The Grange was well equipped and there was ample parking . It was ideal to be able to walk directly from the accommodation and to have The Royal Oak at the end of the lane for a refreshing drink on the return. Thank you for your email. We had a fabulous few days in the Peak District. The accommodation was great and we were really impressed with the food and service at The Royal Oak. We did a great walk on the Saturday and had a brilliant quad biking experience at WildPark - would highly recommend it. Thanks Paul, we had a great time! Made all that much better by having lovely accommodation to come back to at the end of the day! We had a family break at Hurdlow Grange. There were 12 of us aged from 21 to 86. We all thoroughly had a lovely time. The building was clean and tidy and we never ran out of plates, cups, spoons etc as supplies were plentiful. Ample fridge and freezer space. Lots to keep everyone entertained with the games room and the garden area with picnic tables and a BBQ. Even though all the properties were being used there was ample parking and didn’t have to shuffle cars around. The countryside was glorious and very peaceful. Definitely recommend to friends. We had a great stay with you and hope to visit again one day. Really lovely place. We had a wonderful time and took up the opportunity to visit the fishing farm and blaze farm in congerton. A great recommendation! We had a fantastic time, really special. We had an absolutely amazing stay and our guests could not have been more complimentary about the cottages. They were perfect for what we wanted to achieve so thank you so much.We are already talking about hiring the Crewe and Harpur for our first year anniversary so I'm sure we will be back in touch again! Thank you for your email, we thoroughly enjoyed our stay at Amberleigh House and would like to take this opportunity to thank you. The cottage was fully equipped with everything we needed especially with regards to cooking equipment, plates and cutlery. The bedrooms and bathrooms were a perfect size for the weekend, and the whole cottage was clean and tidy. The BBQ area was ideal for our party size, and the grass area at the back was exactly as described. All the information which was provided along with the booking email was really useful and we couldn't have asked for anything more. We had a lovely meal at the Royal Oak and the staff were extremely helpful! We had a great stay at the weekend and a lovely family reunion. Many thanks for having us at Hurdlow at the weekend. We had an incredible time and the accommodation was perfect. We were also really impressed with the food and service at the royal oak. A massive thank you for making our stay at Hurdlow Grange so enjoyable. Everything was perfect. 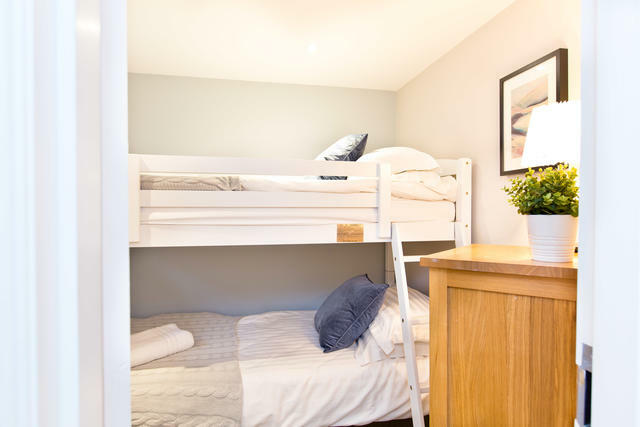 The location, the accommodation and the facilities suited everyone from the oldest (85) to the youngest (7)! The venue exceeded our expectations (I have never stayed anywhere so well equipped!) and it made our family celebration so much more amazing. I trust you have found everything in order and I will certainly write a glowing review on trip advisor! We absolutely loved our stay at Hurdlow Grange - the accommodation was beautifully clean and welcoming when we arrived and was perfect for our big group. We are already thinking about when we can come back! We had a lovely time, thank you. We'll definitely be booking with you again! We just wanted to say a big thank you for what was a really fantastic weekend at Hurdlow Grange. The fact that we could accommodate so many people in comfort, with excellent facilities down to the last detail was really appreciated. We have been meeting together for 13 years now and feedback from friends was that this was one of the best places we have stayed together in. We had no problems during our stay and hope that you have found everything in good order. Hope to stay again with you one day soon. Many thanks for a fantastic weekend. The house was exactly what we wanted. It was lovely, and a perfect location. Good afternoon On behalf of the group of Claremont reunion people who used the Grange, Amberleigh and the Cruk'd Barn from 6th to 10th October, I would just like to say how delighted everyone was with the properties. We had a very happy time in spite of the weather and it was great how many things and places to visit were within a short drive of Hurdlow. We usually have a reunion every three years and virtually everyone expressed a wish to come back to the same place again next time. Many thanks for all the helpful and efficient service we have had throughout our dealings with the company and I look forward to another visit in the future. We, along with a group of family and friends, stayed in The Grange from Friday 26th to Monday 29th of September. Although some of us have stayed in cottages in the UK before, this was a first experience of somewhere so large. Everyone, without exception, was impressed by the property, its facilities and its cleanliness. 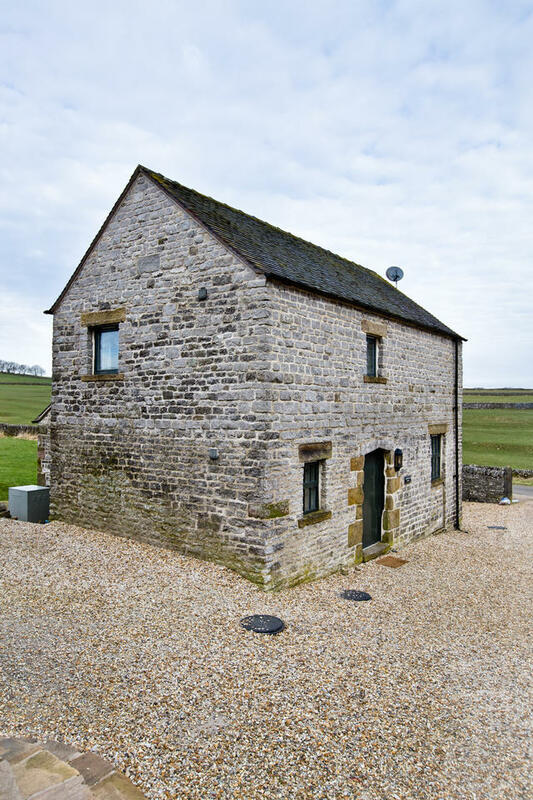 Very well designed to accommodate parties of walkers and dog friendly as well. 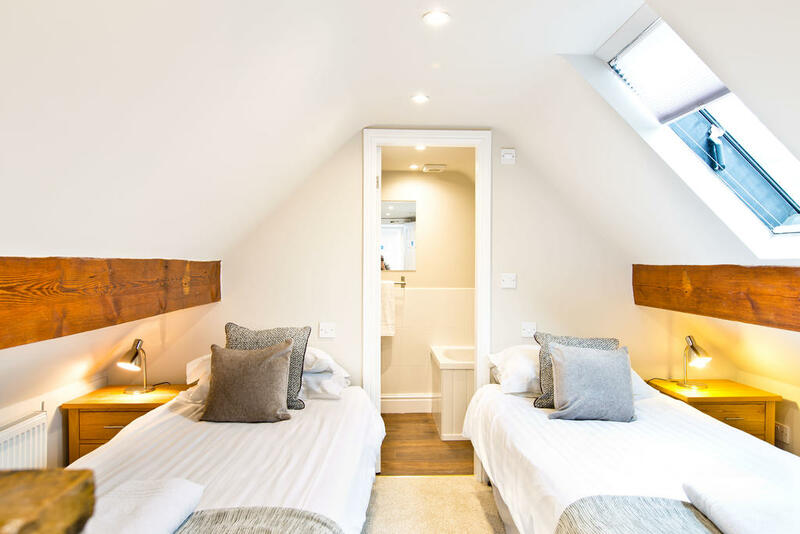 We were pleasantly surprised by some of the little unexpected extras, such as handwash and shower gel in each bathroom and cleaning products in the kitchen. The location is idyllic with many walks starting from the house and the proximity of the Royal Oak (15 minutes walk when thirsty! ), a real plus point if you don’t want to self cater. The food there is excellent. The wi-fi signal is a bit weak and intermittent and that is both a plus and a minus (This is currently being sorted). A plus for a great family getaway from it all. A minus if you have a party including golfers and it is the weekend of the Ryder Cup!! My only suggestion is that if you had toddlers, an expandable child gate would be useful to cordon off the steps down to the scullery and games room. From a customer service perspective both Rachel and Katie were very helpful leading up to the visit, in answering questions and supplying information, as was Paul when we arrived. In summary, we had a weekend which was perfect in every way and certainly exceeded everyone’s expectations. Our visit was for a family special occasion but I don’t think we will need any excuse to repeat the visit soon. PS We used Gourmet Express to cater on the Saturday and the food was superb. Many thanks for a super weekend. Hurdlow Grange, Bats Belfry and Cruck'd Barn were lovely and suited our purposes perfectly. You looked after us so well at the Royal Oak on Friday lunchtime and I can foresee the 'local' branch of our family partaking of victuals in the near future!! All members of our party are keen to 'do it again' and we may well make it a bi-biennial event - in which case we hope to see you again in 2016. Our whole agency attended Hurdlow Grange for a 3 day conference. The facilities were great. Wifi, kitchens stocked with everything you could need. The breakfast baps and lunch provided was fantastic the home made soup and scones really hit the spot. Everyone came about raving about the place. Hi just wanted to drop a line to says thanks for an amazing stay... Everyone loved it..... The food was second to none... Everyone is still raving about the soup and scones... Thanks again you were fantastic..
WOW! What a fantastic venue for Christmas with the family. 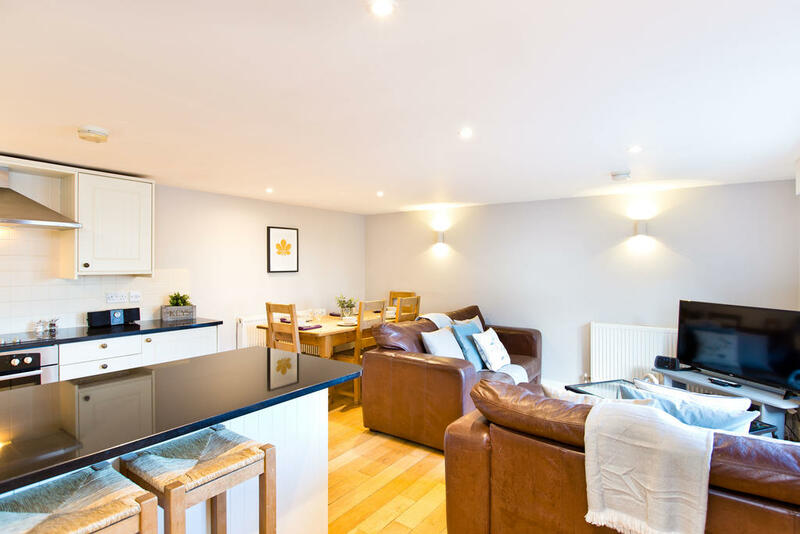 We travelled from Cyprus to be with our adult children who live in the UK as the property was ideally located for all and what a surprise we had when we arrived. Very spacious accommodation excellent facilities with everything we needed even a Christmas tree with lights to add to the delightful atmosphere. The local pub is probably the best I have been in and I have been in a few!! Good quality food with an excellent range of beers brewed locally and the staff were most accommodating and very professional. We had a slight problem on Christmas Day when the oven packed up, disaster was averted as our neighbours stepped in and offered to cook our turkey phew! Christmas dinner sorted. Paul and his staff where excellent at solving the problem and the oven was replaced at 9.00 am on Boxing Day . The whole family agreed that our stay was almost perfect and I would certainly recommend Peak Venues and The Royal Oak pub for any occasion . Hi Paul Yes we had an absolutely fantastic time - everything that we expected. I can't believe the time went so quickly. 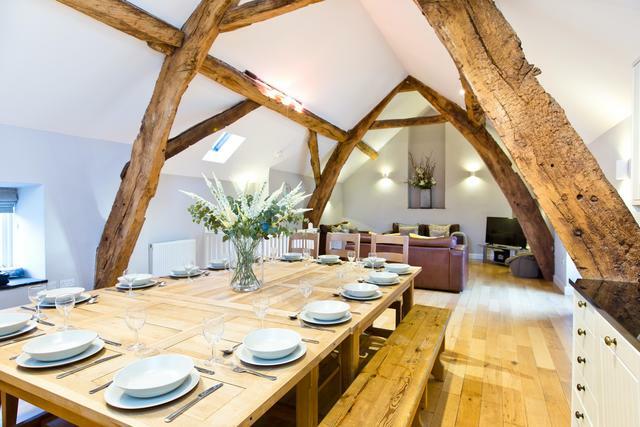 Your houses are beautiful and we were so glad that we booked Cruck'd Barn as the upstairs was absolutely fantastic to party in!! We had an absolutely fantastic time - everything that we expected. I can't believe the time went so quickly. 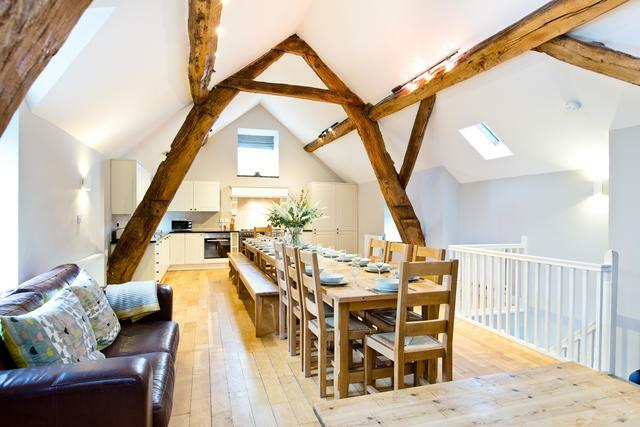 Your houses are beautiful and we were so glad that we booked Cruck'd Barn as the upstairs was absolutely fantastic to party in!! 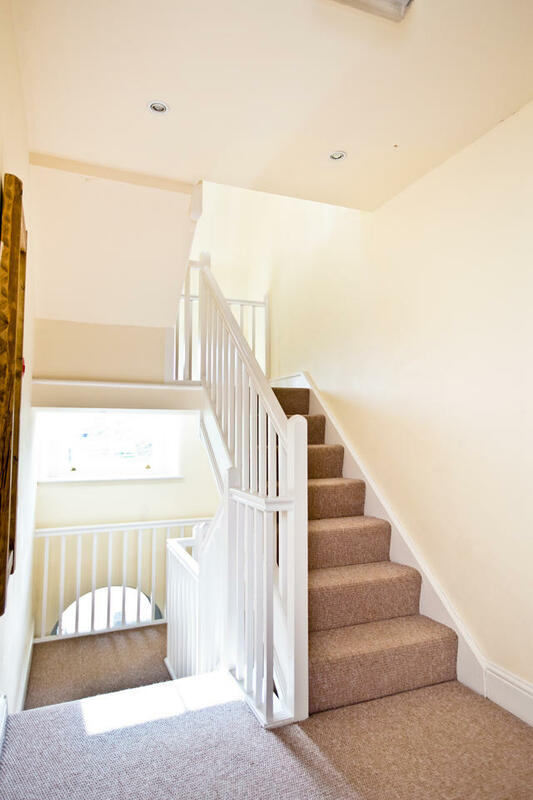 Properties were clean and well supplied with everything you need. Had a great weekend away with the family, plenty of places to visit during the day and properties are good for all getting together at night. I'd forgotten how beautiful the Peak District is, will definately go back. Dear Paul and the team. Just writing to send you a massive thank you for your assistance in making our family party weekend for my 40th birthday a great one. I have had such positive feedback from all my family members remarking on what a great weekend it was. The accommodation and the quality of it was second to none and they said I'd made a good choice of venue and wouldn't hesitate to go back or recommend it. Some even suggested making it an annual event! Everything was handled by your team from start to finish with the utmost efficiency and it all seems to be a really well oiled machine, from the booking process to the meal at the Royal Oak where the food was excellent and the service, friendly. Please pass on our thanks to all the team members involved. I just wanted to email and say a huge thank you for everybody who has helped with this booking. We had a BRILLIANT weekend and the properties by far exceeded our expectations. They were so clean and beautifully decorated and equipped with everything we could have wanted. It was so easy to make all the arrangements and collecting the keys at the pub was as simple as it could be. We really enjoyed our stay. 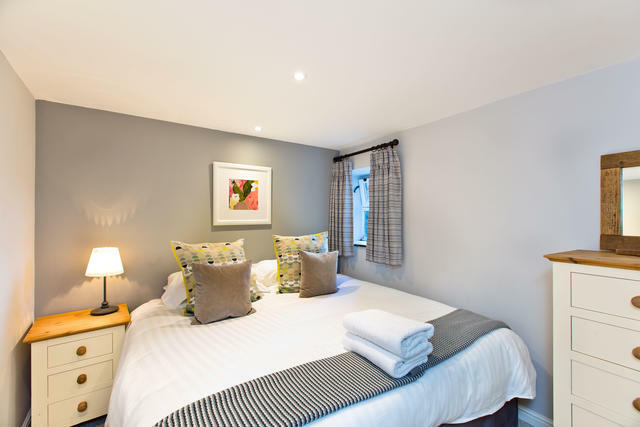 The accommodation is great, we enjoyed the food at The Royal Oak and the staff were very friendly and helpful. We have just returned from a brilliant weekend at The Grange. Just wanted to comment on what a lovely property it is in such a beautiful location. 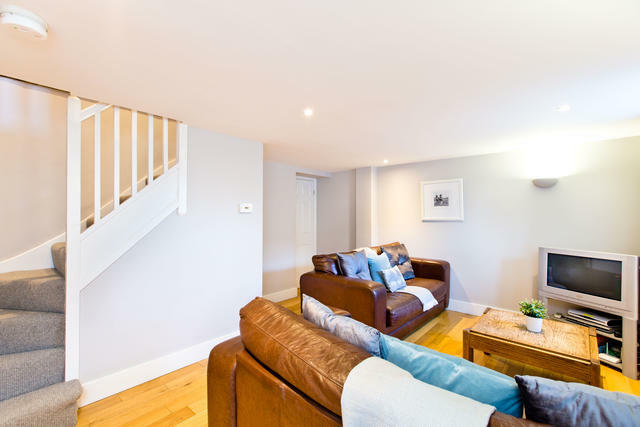 The house was immaculately clean and the staff were very attentive. Paul seemed worried about the water damage you had suffered recently but it caused no problems and your team must have worked very hard to rectify the damage. We had a meal at the Royal Oak we was fabulous again the staff were fantastic and the atmosphere relaxed and friendly my only regret was not being able to finish my meal due to the portion size. Your team really must be congratulated in providing such a wonderful relaxed holiday experience. We had a fantastic weekend and everyone that was there commented on what a great venue it was for a large group of friends. I'd like to thank you for the assisting me to organise an unforgettable weekend and 40th birthday! Thank you. We had a lovely time. Thanks to all at Peak Venues. We will certainly recommend it and may be back ourselves very soon. I wanted to say a very big ‘thank you’ to you all following our recent stay. 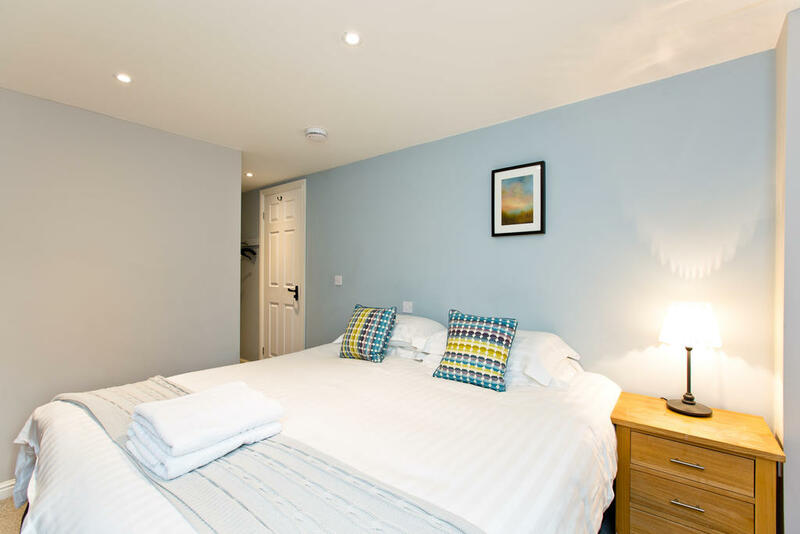 The accommodation was truly superb and we were all very impressed with the level of care which you clearly take to ensure your guests are well looked after, and all their needs anticipated, even down to ice in the freezer and laying on the projector screen. Thanks again for a fantastic stay - the Grange (once we made it there!) exceeded our expectations in pretty much every department. Also, the food yesterday lunchtime was superb. Hi Paul et al. Brilliant weekend – snow was great! 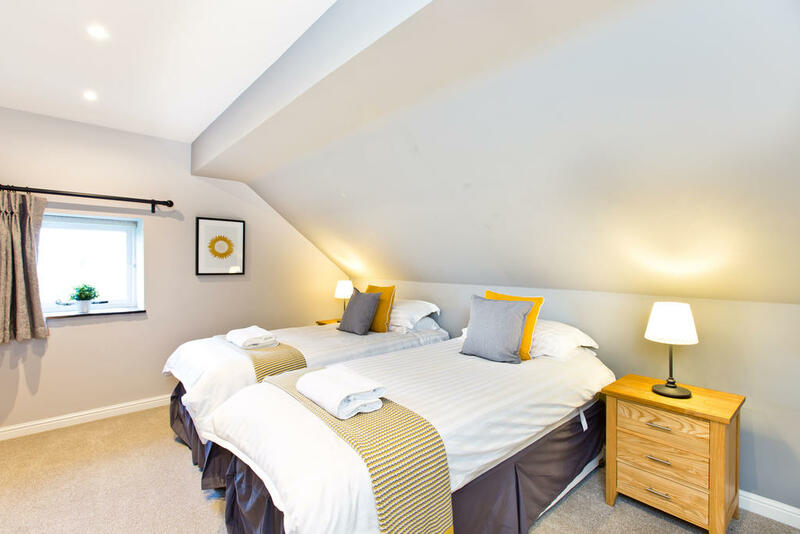 Excellent accommodation – really well equipped. Comfy beds and great showers. The glass panel in the sitting room floor was genius! I don’t think there was anything we wished we had. Thanks for looking after us so well – the personal touch means a lot. We shall certainly be recommending you! Thank you so much for our wonderful stay, and for all your help getting us in through the snow. We had a fabulous time, and can't wait to come back some time. Thanks for a great time at Hurdlow Grange. The cottages were fantastic and the location superb. We've stayed at a few large group venues over the past few years and Hurdlow was definitely the best. Once again thanks very much and we'll definitely be back in the future. Thanks Paul, we had a great time. 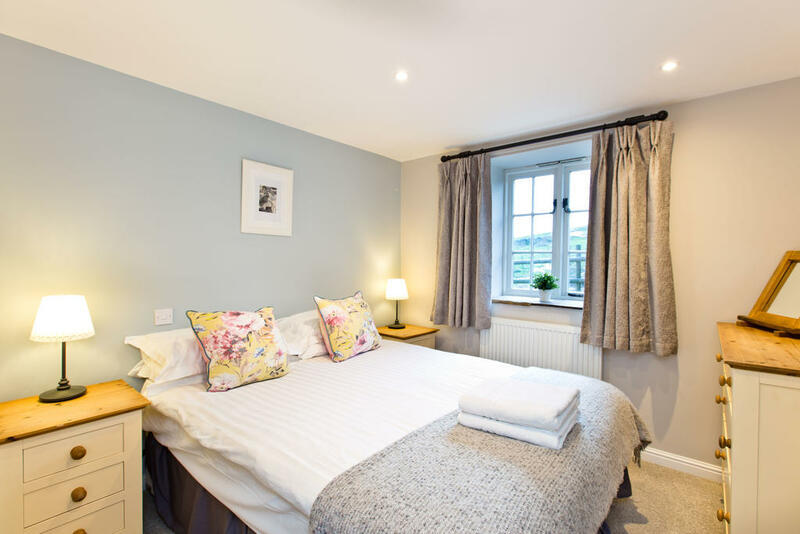 Our accommodation at Hurdlow Grange was very good, ideal for our purposes, and we also very much enjoyed our New Year's day meal at the Royal Oak. Dear Team I wanted to send a BIG thank you to you all for a fantastic Christmas ,we felt most welcome both in the lovely cottage and the pub. We would highly recommend you ! We all had a wonderful time staying the cottages. It was the perfect venue for my birthday; so cosy, clean and well equipped - thank you! Had a fantastic weekend at The Grange, the house was excellent, the location and scenery was spot on and your help and assistance has been great. I would recommend it to anyone and I will write a review on trip advisor in next few days. Thank you for your email. We did enjoy our time in the Peaks and we certainly saw quite a bit of it on our 32 mile bike ride whilst we were there! The accommodation was superb and we also enjoyed our time in the Royal Oak. Thank you for making our stay at The Grange so special, what a wonderful place to stay and very well equipped. We all had a really great time and will definitely be staying again in the future. Excellent accommodation,everything you said it would be, superb facilities and many thanks for liaising with hospital re one of our party,who returned to us on Saturday. Our party had a thoroughly enjoyable stay at Hurdlow Grange. Everyone was impressed by their bedroom facilities and bathrooms. We found the lounge very cosy for a group of this size, comfortable and relaxing. The kitchen facilities were more than adequate with plenty of crockery/utensils etc. and a very efficient cooker. We enjoyed using the large dining room for our meals. A couple of trays would have been handy for carrying cups and glasses around, but that is just a minor point. Overall, we had an excellent couple of days cycling and exploring the area and will certainly recommend you to our friends. We all had such a fabulous weekend away....the cottages and pub were amazing. We will definitely be arranging another trip in the near future. 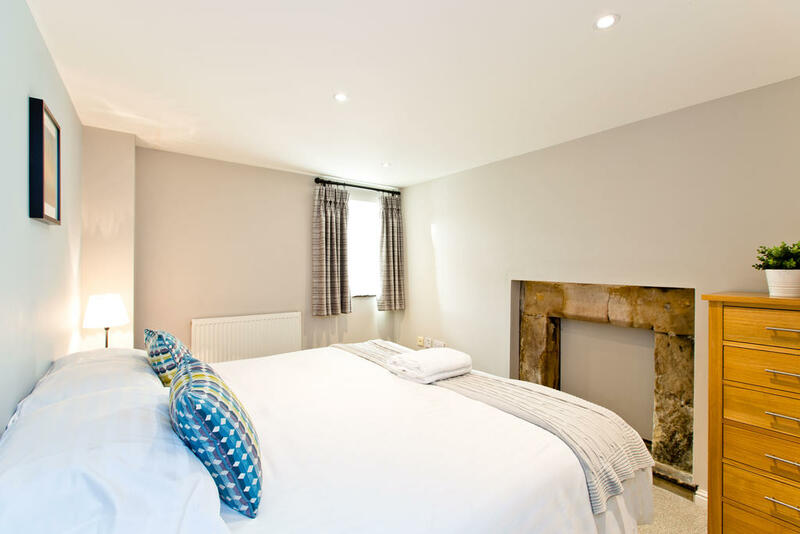 Many thanks for the email, my family and I had a thoroughly enjoyable stay at the two properties we had (Applegarth & Bat’s Belfry) and it provided a great location for me to celebrate my 40th birthday with my family and I’d definitely recommend it as a place for others to stay. We had a fantastic time thanks. 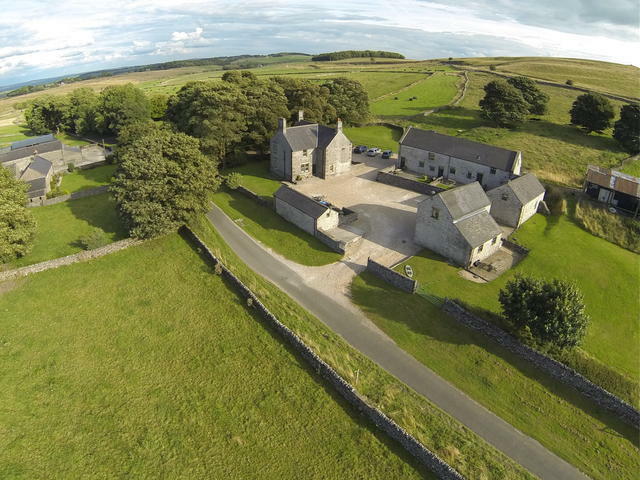 Applegarth was perfect and extremely well equipped. We particularly enjoyed the food at the Royal Oak so ended up eating there for three of the four nights which was very welcome after a day on the hills. Thank you for the use of the cottages this weekend, we had the most amazing time and the accommodation was perfect - just what we needed. 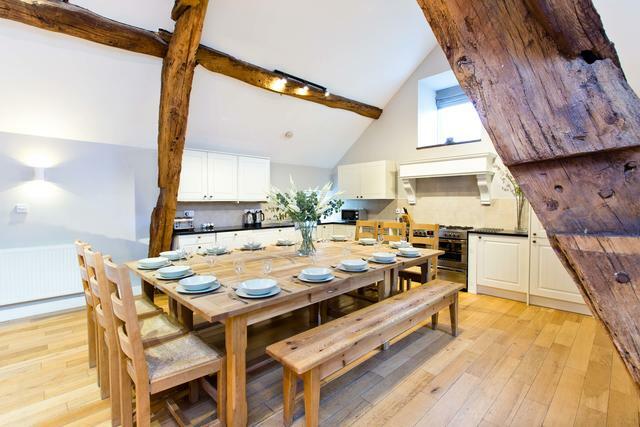 The cottages were very clean, well presented and the communal space, particularly in Cruck'd Barn, was perfect for a entertaining a large group. We couldn't have asked for anything better, and I'm sure we will be back for a visit at some point. 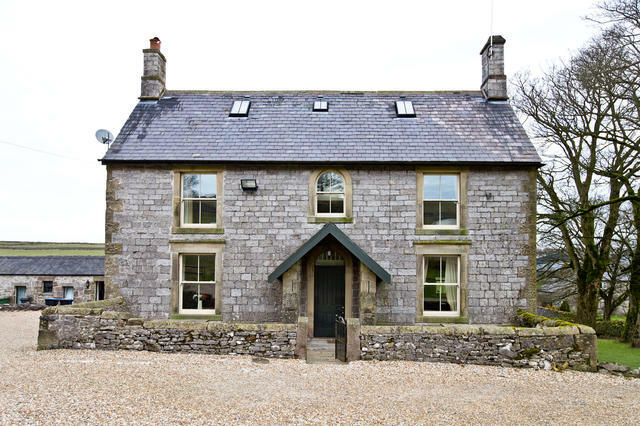 Also I have to say that the service we have received from yourselves, from initially enquiring about the properties, right through to our departure, has been faultless - extremely helpful and accommodating. 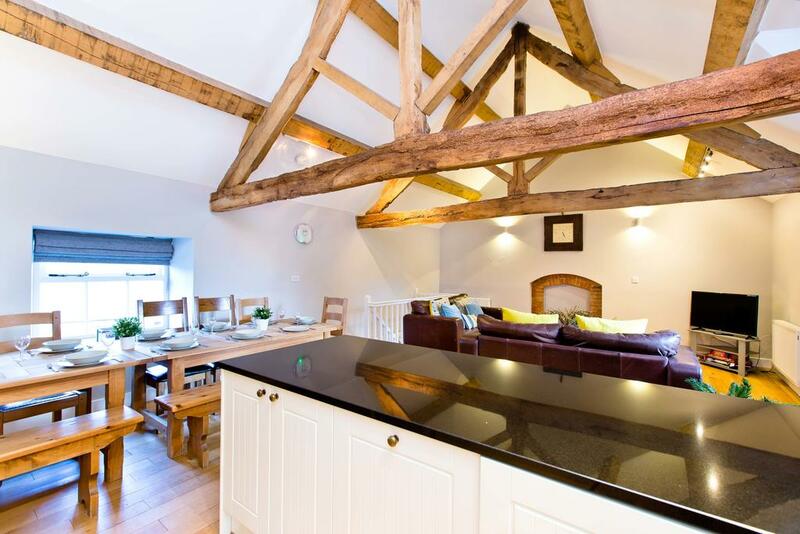 We had brilliant time in the peak district and really liked Hurdlow Grange especially Cruck'd Barn. It was a very special place to celebrate my husbands 60th birthday with friends. Shame about the weather but it just means we will have to return! We had a good evening in the pub on the Saturday night with good food and lovely staff. Will write a review on Facebook and recommend to friends looking for a place to go for a break. I would just like to take this opportunity to thank you so much. We had a wonderful time at the cottages. They were so comfortable and we enjoyed our stay there while visiting the beautiful Peak District. We would all like to say thank you to your colleagues who made us feel very welcome and were very helpful as well. We all had a super time and appreciate all that was done to make our stay an enjoyable one. 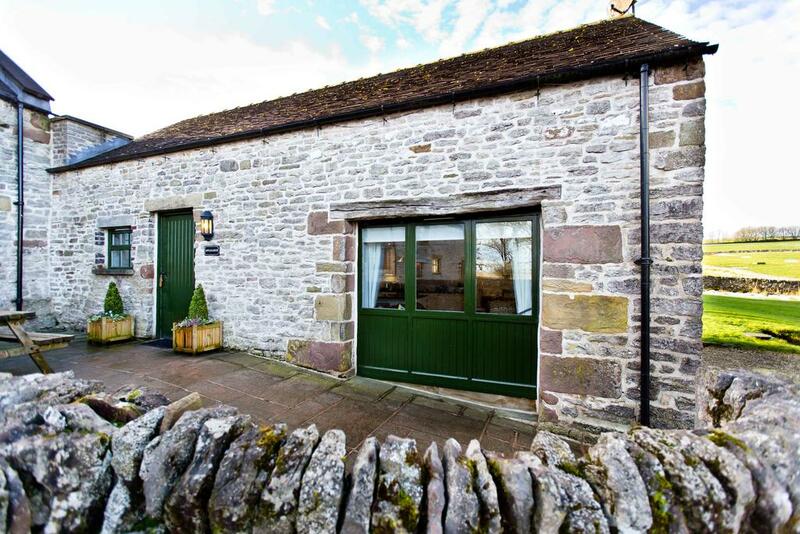 Just to let you know we will always recommend your cottages to our family and friends and hope to return again soon. Dear all of the team at Hurdlow, I just wanted to send you an email to say a HUGE thank you for all of your help in making our weekend at Hurdlow last weekend so special. The venue was absolutely perfect and every single guest fell in love with the beautiful cottage, amazing facilities and the fantastic surroundings. It really was a weekend full of incredible memories and the 'bride to be' left a very happy lady. So thank you so so much to all of the team for helping to set up the cottage as we required and for all of the help along the way. I know that all 14 girls will definitely be highly recommending the cottages to their friends and families. Just a short note to thank you and all the staff at the Royal Oak for making our weekend such a great success. All the guests were really impressed with the location (as we knew they would be) and the food at the pub was great, quickly served by good humoured, calm and patient staff! Everything worked well, the venue and surrounds are perfect for a re-union such as ours that catered impressively for all ages and levels of mobility. I am sure we will be back.......and probably some of the others. Thanks again P.S The Hartington bitter was bloody lovely - a great pint that got huge amounts of praise! I would like to let everyone know how much we enjoyed celebrating my husband's 40th birthday staying at The Grange and Cruck'd Barn. Every member of staff that we came into contact with, from our initial enquiry with Paul through to finally checking out, couldn't have been more helpful or accommodating. It took us a long time to find a venue that suited our needs and The Grange and Cruck'd Barn were perfect. 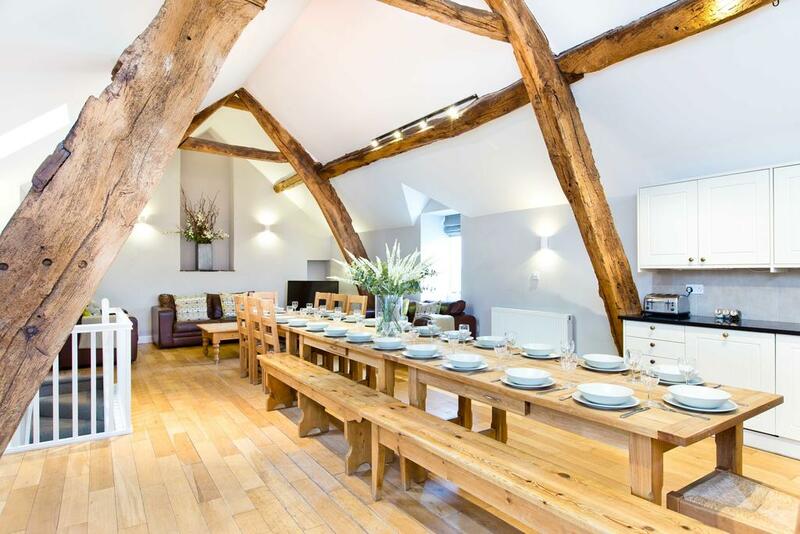 Both venues were excellently furnished and equipped, and the Cruck'd Barn provided the perfect setting for a dinner party for 20. Sunday lunch at the Royal Oak finished the weekend off perfectly - food was fab! We and all of our guests had a truly wonderful time and the weekend was one that will be remembered for a long time for all the right reasons! I think I won't be the only person in the party to say that we had a fantastic time at Hurdlow Grange and we were all extremely impressed with the venue and the facilities. Can't speak more highly of it! Thank you very much for an excellent weekend. We had a great time, the food at the pub was great and the real log fire on a snowy Saturday afternoon helped to make the occasion (and warm people up after our walk in the snow). 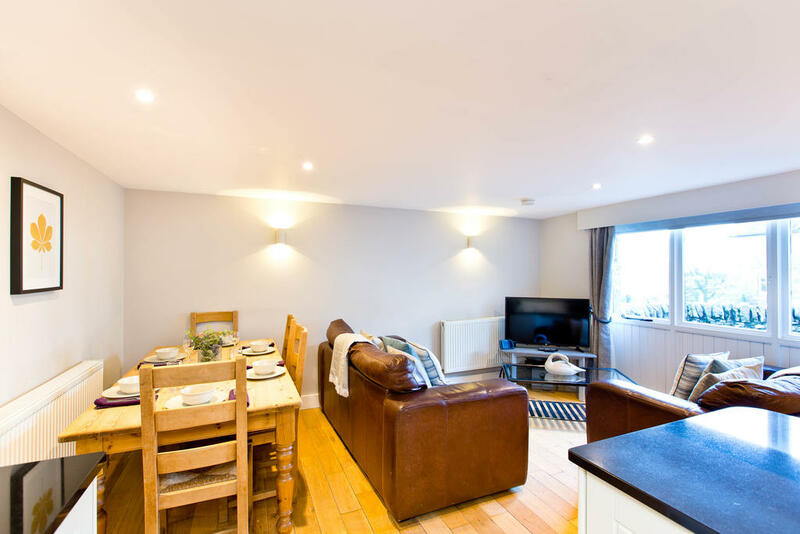 The properties were excellent for a large gathering and everyone commented on them. We had a really lovely time at Hurdlow. Can't fault anything, plus a super meal at the Royal Oak. The properties were all exceptional and I enjoyed a very happy birthday celebration, thanks in no small part to the quality and offerings of the accommodation. We will look to come back again (I’ll try think of another milestone…. ), if only to try the Pub food – some of our party went and were effusive about the menu! Thank you so much, we had the most amazing weekend. The cottages were perfect and thought your service before and during were excellent. We were also very lucky with the weather!! The food at the pub was outstanding and quick to get out to us aswell, even though we all turned up for lunch on the Saturday after our walk without booking. After posting photo's on facebook I have already had a couple of people ask where the cottages were, so have passed on your details. We will be back, when I can summon the energy to organise again. We found everything very comfortable and clean - Hot water was plentiful. 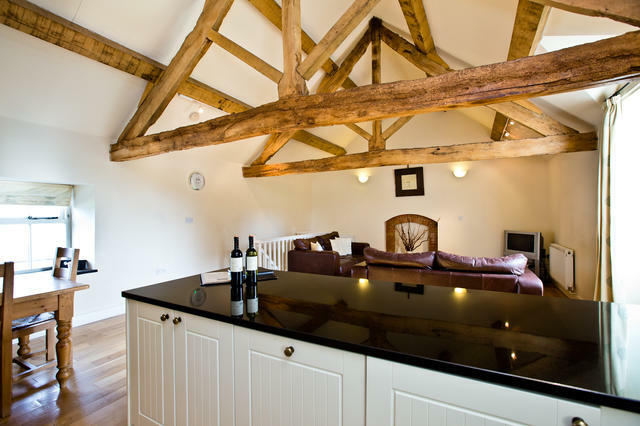 The location is superb and the 'party room' in Cruck'd barn was marvellous. It was good to have the 'games room' for a table tennis tournament - all in all an excellent weekend!Thanks again - we may well be back if we decide to re-visit the area. Once again, many thanks to you and your Team for the contribution to what was a special birthday weekend for my wife. You’ve got a great gig there, a great setting and a wonderfully laid out and presented set of houses, and we felt comfortable and at home from the outset. Many thanks again Paul, to you and your team. I’m so glad that we chose to stay with you. Many thanks for a great week, accommodation was excellent and even the weather was not too bad. The sun shone brightly on the day we needed it! We will not be back for another wedding but will certainly be back for some R and R.
We had an excellent time staying at Hurdlow Grange last weekend. It was a fun weekend had by all and the accommodation and its surroundings were perfect! The Cottages are beatifully decorated and kept. The surrounding fields are lovely, specially if travelling with kids as cows and sheeps are in the front door. The place is isolated, The Royal Oak is almost a mille away. Cottages have a private patio area with BBQ, if the weather allows it! Having lunch or dinner in The Royal Oak is a must do, the food is wonderful! We would like to say a big thank you to you and your team for looking after us so well and being so helpful with regard to our booking for the weekend of our joint 50th birthday celebration at Hurdlow Grange last weekend. It felt like nothing was too much of a problem, whether it was agreeing to us having a marquee, or organising early access to erect the marquee, and for allowing us to make a bit of noise. We also thank you for all the advice with regard to Caterers. Ruth at Peak District Fine Foods provided excellent food and a great service. 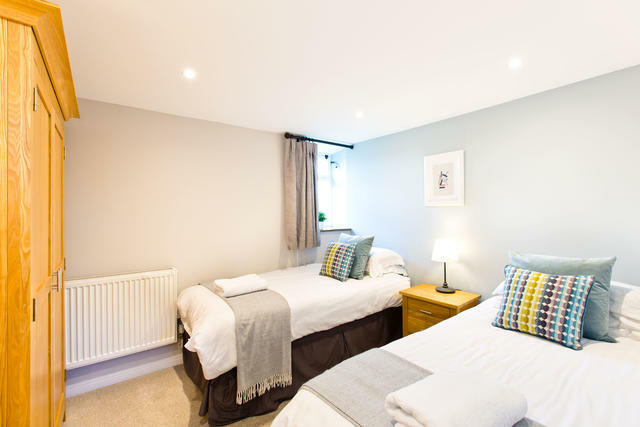 We would like to praise the accommodation and facilities at Hurdlow Grange, all our friends were highly complementary of the houses, the bedrooms, bathrooms and kitchens. The Cruck’d Barn worked brilliantly as a social space for the whole group where we managed to assemble all 42 of us for drinks Friday evening, and Saturday evening after the music stopped. As I said in our earlier email the whole weekend was brilliant, perfect in every way. Thank you once again for helping make our party such a success. 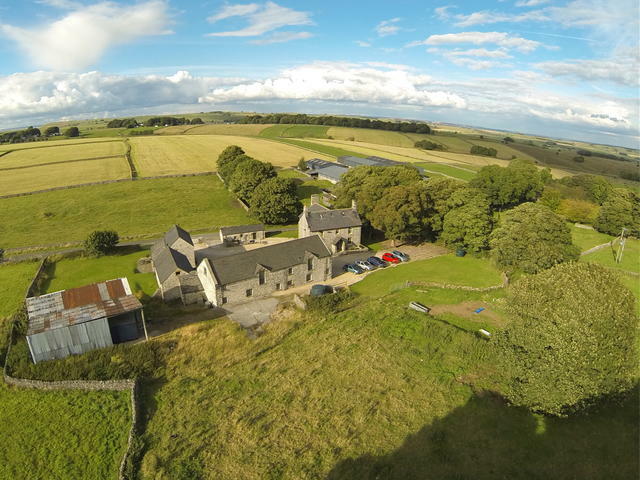 We all had a wonderful weekend and will be recommending the Grange to friends and family. We had a great time at Th Grange, the set up was fantastic, also the Pub and meals were marvelous and very friendly and helpful staff. We had a fabulous weekend; over and over we heard how nice the cottages are, and people really enjoyed visiting the Peaks. Thanks for making our wedding celebrations run as smoothly as possible - we loved every minute of it. We all had a fantastic time. 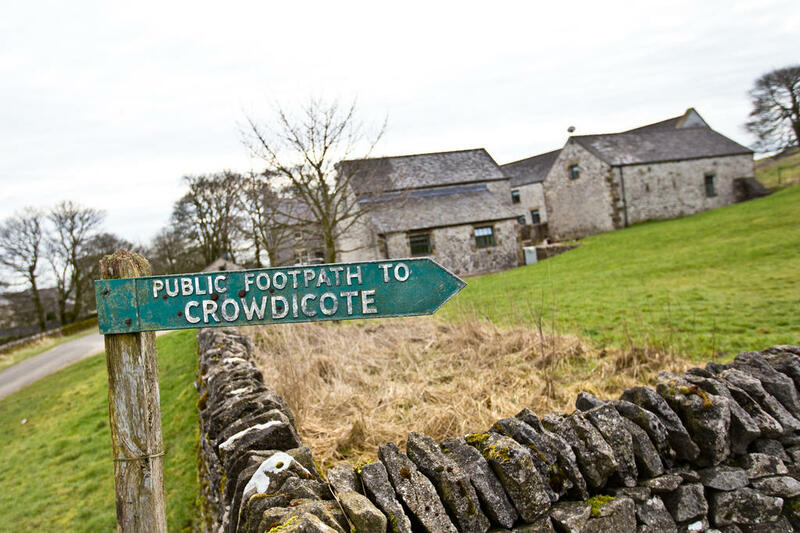 The venue was ideal - just a short walk to the local pub with stunning walks right on the doorstep. The accommodation was great. 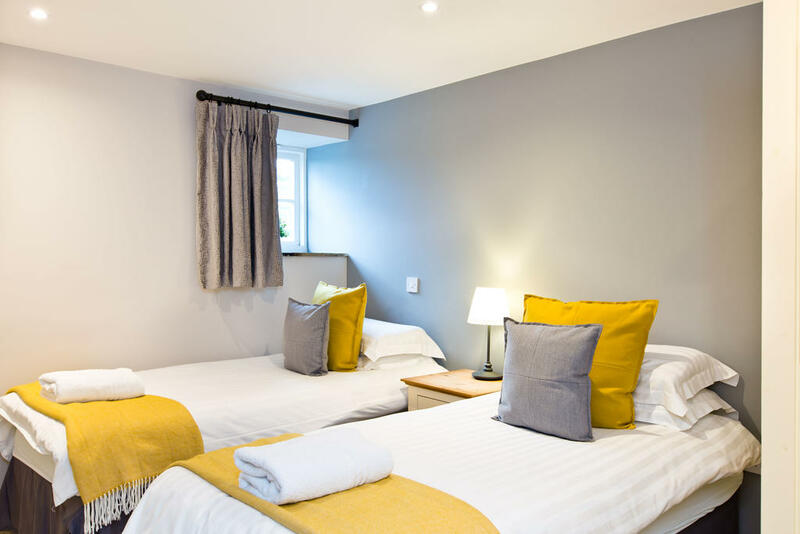 It was perfect for a large group with good sized bedrooms and living accommodation and with a well equipped kitchen with ample cutlery and crockery and a separate huge fridge for all our liquid refreshments! The rooms were lovely and comfortable and everyone slept well and most were en suite, and the lounge and dining room easily catered for a large group. There was good information provided about the accommodation, the local area, attractions and walks and the Management were eager to accommodate any requests we had. Overall it was fabulous ... I couldn't have asked for anything better and would love to come back sometime in the future and I know a couple of my friends who also stayed are interested in coming back too. It was a perfect location for by birthday celebrations and it made the weekend very special. Dear Paul and the rest of the team I would just like to thank you for the wonderful weekend at Hurdlow Grange. We all had a fantastic time and everyone was raving about the quality of the food and the excellent service at the Royal Oak. Thanks for everything and we look forward to seeing you in December, if not before! Hi Paul and team, a brief note to thank you for a lovely break at The Grange, we have had a fantastic time. The Grange had all we needed to thoroughly enjoy ourselves over the new year period. We had a fab time and would not hesitate to recommend the property to all our friends, and the pub which we thoroughly enjoyed. Wonderful stay. Countryside just beautiful. Loved Cruck'd Barn and will come back again. Pub very good and would recommend. Chatsworth Fantastic. My friends bought me here for my 70th birthday. What a beautiful tranquil place. All very quiet and no alcohol consumed at all!! Fab position and location. Would hope we may return. We had a wonderful time and I loved all the properties. 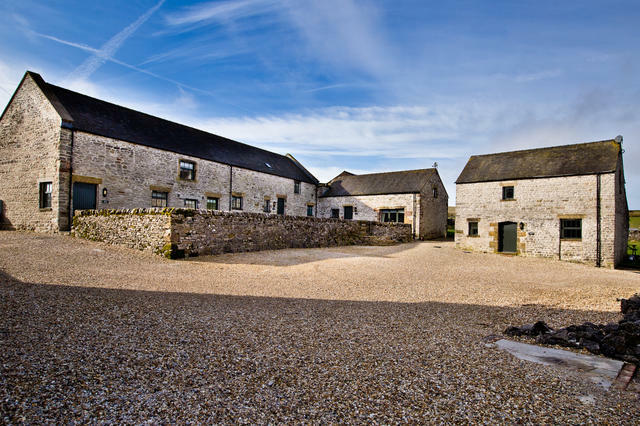 We rented The Grange and Cruck'd Barn for a 50th birthday celebration with 22 friends and family and had an absolutely fabulous time. 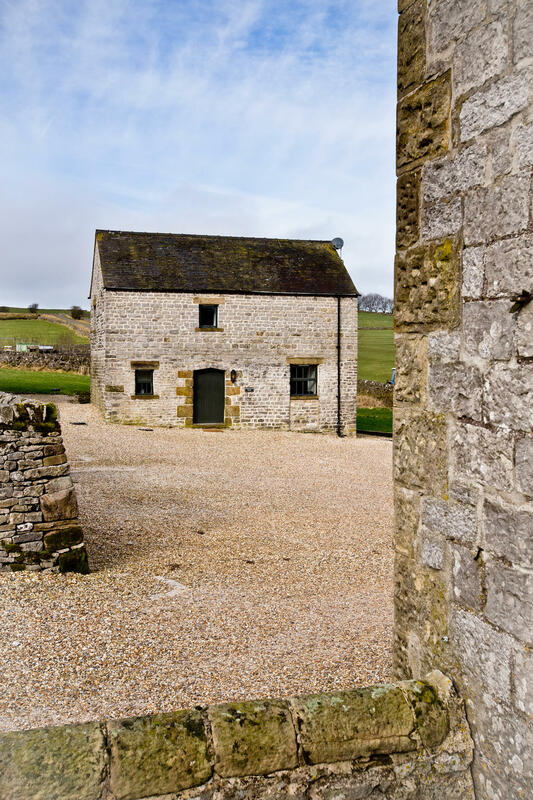 Some of the rooms in The Grange are slightly more spacious than in Cruck'd Barn but the wonderful 'party room' above the barn worked brilliantly and we prepared most of the food in the larger kitchen in The Grange. The setting is beautiful, totally peaceful and very safe for the two 10 year olds to wander around making friends with the cows! We had lunch in the pub on Sunday, good quality and hearty portions. Paul was so helpful both up to and during the weekend and we got the feeling that he genuinely wanted to make our stay as good as it possibly could be.<br /><br /> All of our guests thought the place was a real find. We would definitely go back again. Great, well equipped modern rooms in a beautiful period property. Fantastic views. Food in the Royal Oak pub down the road is excellent. Staff incredibly helpful. We are a small wind band and each year take a weekend music making break. We have been doing this for 14 years now and Hurdlow is one of the best venues we have yet found. Paul White and his team have done a brilliant job on the Grange and barns and we cannot recommend it highly enough. We had a fantastic few days. 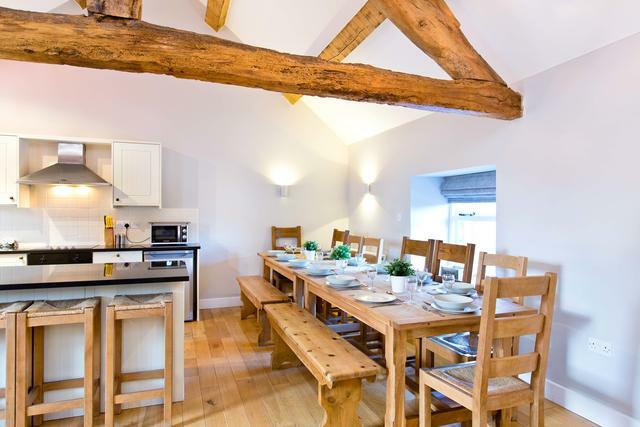 The accommodation was perfect for our big family get-together, so thoughtfully designed and equipped. There was more than enough space for us all and we wanted for nothing. The Royal Oak down the road was an ideal stop-off on our walks! Hurdlow Grange was an excellent venue for our group of 22 walkers. We were able to eat together (at one time) albeit rather a tight fit. The Barn enabled us to meet together in one place in the evening and the Table Tennis table was popular and good fun. We will be back again soon. Thank you so much for all your help at the weekend and for making our stay at Hurdlow Grange so very special. We all had the most wonderful time both at the Grange and the pub. The welcome, food and service on Saturday was second to none and really was the icing on the cake of the weekend. The Grange is gorgeous and perfect for our needs. We hope to book again next year for a hen reunion! We will all be telling everyone we know how amazing it was. Thanks so much to you and your staff. Compliments to the chef also - the fish pie will be talked about for years to come! Hurdlow Grange is an excellent place for group celebrations - we found it had a great atmosphere and wonderful ambience. In particular the large barns with those vaulted ceilings were a perfect setting for the formal drinks and meal and the smaller barns allowed more intimate gatherings. Without exception all our party (35 plus) enjoyed the weekend immensely. It goes without saying that having the Peak District on the doorstep is fantastic. The food and service were superb (Top Nosh Caterers) - quietly efficient and unobtrusive. Coped brilliantly with our requests for two sittings (children and adults). This year we celebrated our 50th wedding anniversary and we wanted to do something special with all our family. 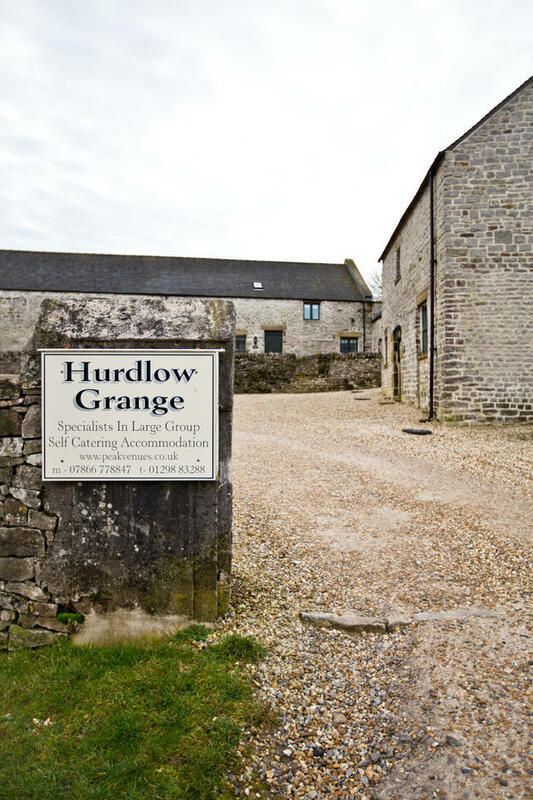 Finding a place for 6 children, their spouses and 25 grandchildren plus their husband and friends was not easy and we are so grateful that we found Hurdlow Grange early to enable us to take over the site. The standard of accommodation was excellent and above our expectations, everything was how we had hoped which contributed significantly towards such a wonderful week. Everyone was well satisfied, the cottages were well appointed, the young ones found plenty to amuse themselves and the adults enjoyed barbeques and long evenings catching up on each other. We were fortunate to have good weather with only one day of rain and we found lots to do in the area. Canoeing, rock climbing, cycling, walking and exploring were just some of the activities we packed into the week. We cannot thank Paul and his team enough for making this such an enjoyable week. Hurdlow Grange and Bats Belfry- We thought the properties were beautifully set out and very clean. We did lots of cooking for the group of 20 and it was great to have enough of everything pots pans etc! We had a lovely time thanks! Royal Oak, Hurdlow –Just a stroll down the lane, our very own award winning pub offer open fires, hidden corners, local ales and of course ‘great homemade pub food’. Booking advised. Devonshire Arms, Hartington - Centrally located in the heart of the village – good stop for lunch. The Woodyard, Bakewell - Great location by the river in Bakewell for a family friendly Restaurant - Serves both lunch and dinner. The Old Smithy Café ,Monyash - Rustic! Famous for its breakfast featured in the Top 50 Breakfast Book in the country. Character décor, open year round – walkers and bikers welcome. Also serves lunch daily with dinner on certain days. Longnor Craft Centre and Coffee Shop -Longnor Craft Centre occupies the old Market Hall sitting proudly at the top of the cobbled square in the heart of the village. Food served all day with huge slices of home-made cake on the menu! 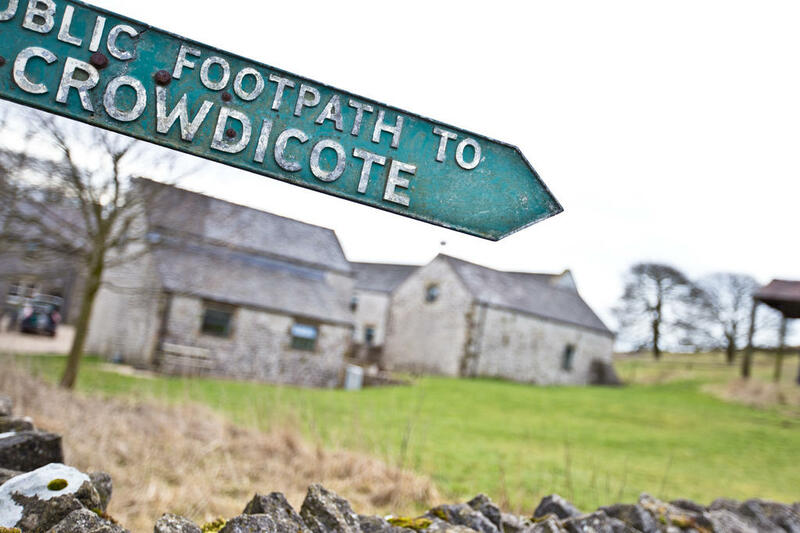 As our award winning pub is only 0.8 mile stroll down the lane, it would be rude not to pop in and sample the extensive menu and try the various local beers on offer. Reservations are recommended, please call 01298 83288. With the Tissington and High Peak Trails close by you can walk for miles along these old railway lines. Both trails meet at Parsley Hay, the Tissington Trail runs along a 13 mile route from Ashbourne to Parsley Hay, while the High Peak Trail is 17.5 miles longroute from the High Peak junction near Cromford to Dowlow. Surrounded by beautiful countryside the traffic-free trail is ideal for horse riders, cyclists and walkers of all abilities. It is also suitable for wheel chairs and pushchairs along the flat sections and the trail is mainly mud free which is quite rare in the Peak District. To find the nearest access turn left out of Hurdlow Grange and walk up the lane for ½ mile and you will come to a track clearly marked on you right, follow this until you reach the beginning of the trail on the right hand side. 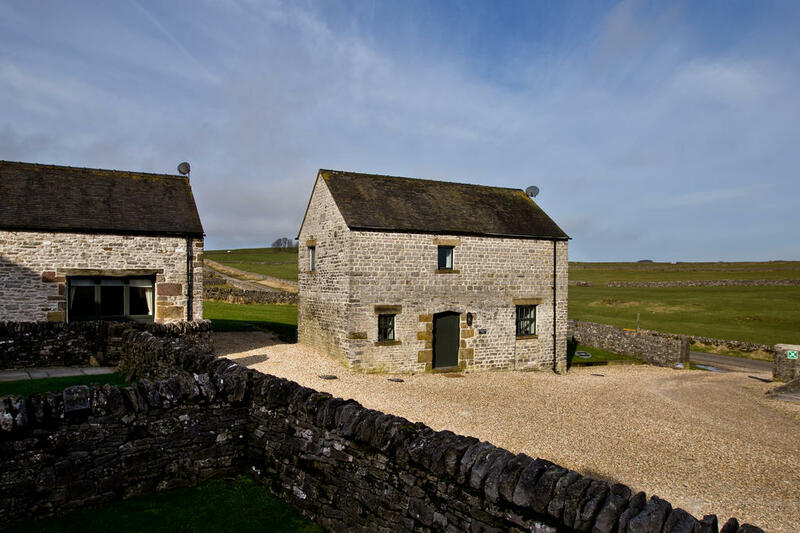 The nearest bike hire can be found at Parsley Hay which is 2.5 miles away and is at the junction of the High Peak and Tissington Trails. A great day out for the family with something for everyone to enjoy. Start off with a visit to the famous Danebridge Fisheries, a great place to visit with kids, here you can fish in the well-stocked pool, catch your own supper or feed the trout (food supplied). Then a visit to the Wincle Brewery, where you can even do a one day brewing course! After a trip to the brewery why not call into the Ship Inn, just down the lane where you can sample Wincle’s fine ales in the pretty beer garden. Follow up with finally finishing the day off with a visit to Blaze Farm, a working farm that has become famous for their awarding winning Hilly Billy Ice Cream which is all made on the farm using the milk from their dairy herd. With tea rooms, nature trials and animals to pet there is something for everyone! The Grange- 2 tables together with seating for 14 guests (All chairs). Bat’s Belfry- 2 x tables, seating for 14 guests (Mixture of chairs & benches). 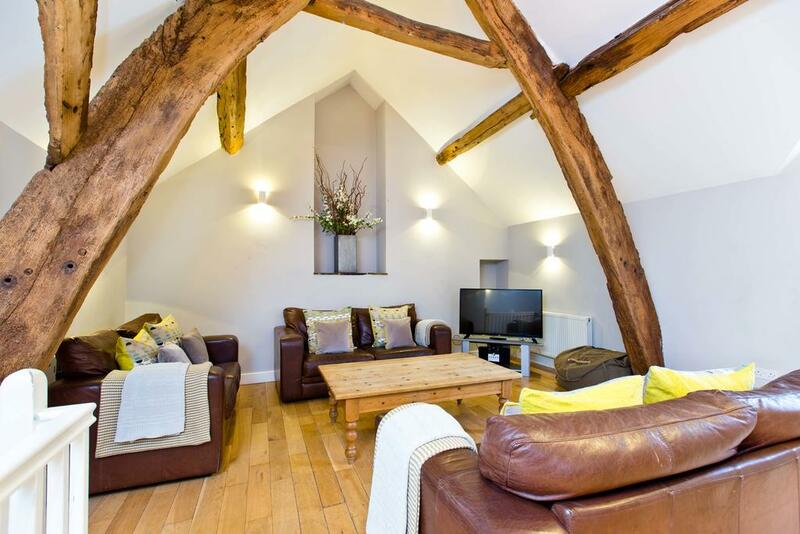 Cruck’d Barn - This property has a fabulous beamed open plan room (dining/kitchen/lounge) and offers a totally flexible communal space to informally socialise altogether. 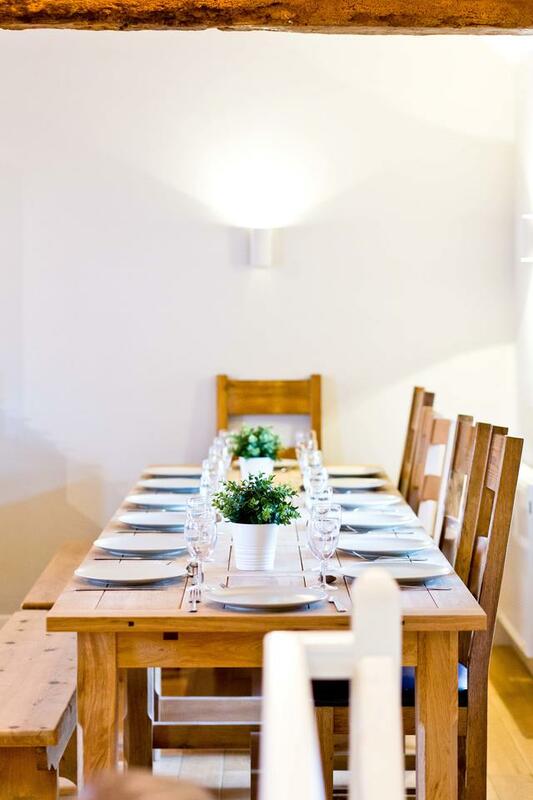 As standard, there are 3 x tables in situ which seat up to 16 guests. Should you wish to enjoy a more formal celebration meal during your stay, we can offer additional table leaves (if pre-booked in advance) to dine between 16 and 36 guests. This is a brilliant solution to increase dining capacity but we suggest that for the rest of the duration of your stay, you may wish to revert the layout back to the smaller configuration to increase informal social space. Applegarth- 1 x table, seating for 6 guests (Mixture of chairs & benches). Amberleigh House- 1 x table, seating for 8 guests (Mixture of chairs & benches). Drum style BBQ outside each property – available for use from 01st April through to 31st October, please supply your own charcoal and lighting equipment. Please note that we are dog friendly at these properties however there are livestock in the surrounding fields so dogs must be kept under control at all times. For your information, a maximum of two dogs are allowed per property if pre-arranged - you will be expected to keep them out of the bedrooms and off the soft furnishings. We do charge £20 per dog for the duration of your stay. Please see our dog policy for further details. The nearest pub is The Royal Oak a 0.8 mile walk down the country lane – If you are planning to walk back at night bring a torch.